What is the Multi-Path TCP? A major update of the standardisation overview. The Transmission Control Protocol (TCP) has been standardised by the IETF more than 30 years ago in RFC 793. Clearly, a lot of improvements have been made to TCP during these years. However, one major property did not change: a TCP connection is established between two IP-addresses (client and server). These addresses must remain fixed over the whole connection lifetime. A change of an address – which is not unlikely in mobility scenarios – breaks the connection. Also, even if an endpoints has multiple addresses (e.g. a smartphone connected to 3G/4G and WLAN simultaneously, or a system connected to two providers) can just use the selected address. Any change requires to reestablish the connection with another address. Click here for full size! Multi-Path TCP (MPTCP), defined in RFC 6824, is a relatively new extension to TCP that adds multi-homing and multi-path transport capabilities to TCP. That is, instead of just connecting an endpoint to one network – corresponding to a single Internet Service Provider (ISP) – it is possible to have connectivity to multiple networks (usually: multiple ISPs) simultaneously. Then, in case of a failure within some of the networks, an MPTCP connection can still remain active unless all networks stop working. This so-called multi-homing feature is particularly necessary for redundancy. The example figure above shows a setup with Endpoint A being connected to three networks and Endpoint B being connected to three networks. Also, MPTCP is able to modify addresses during the connection lifetime (e.g. on handover in mobility scenarios). Of course, having multiple network connections – and having to pay for them – leads to the motivation of using all connections simultaneously, by distributing the data over all possible paths. This is denoted as Concurrent Multipath Transfer (CMT) or shortly multi-path transfer; this is the most important feature of MPTCP. MPTCP has many mechanisms in common with the Stream Control Transmission Protocol (SCTP) and its extensions. SCTP has been delevoped earlier, but – as a new protocol – requires acceptance by middleboxes like firewalls or Network Address Translation (NAT) with Port Address Translation (PAT) to work in many Internet setups (e.g. at a home user's site). MPTCP, on the other hand, has been developed to work around these issues: MPTCP packets look, from the perspective of a middlebox, like regular TCP flows. That is, existing firewalls and NAT/PAT devices can handle them without any change. MPTCP is still under development, with ongoing research work on how to handle the scheduling of data to multiple paths, how to efficiently perform congestion control and how to achieve fairness of resource sharing. This research is currently ongoing – also of course with help of the NorNet Testbed – and contributes knowledge and insights to the ongoing standardisation process within the IETF MPTCP Working Group. If you are interested in MPTCP performance evaluation, also have a look at the NetPerfMeter application! The complete BibTeX references in a single file can be found here! Luo, Yu; Zhou, Xing; Dreibholz, Thomas and Kuang, Hanbao: ``A Real-Time Video Streaming System over IPv6+MPTCP Technology´´ (PDF, 212 KiB, ), in Proceedings of the 1st International Workshop on Recent Advances for Multi-Clouds and Mobile Edge Computing (M2EC) in conjunction with the 33rd International Conference on Advanced Information Networking and Applications (AINA), pp. 1007–1019, DOI 10.1007/978-3-030-15035-8_99, ISBN 978-3-030-15034-1, Matsue, Shimane/Japan, March 27, 2019, [BibTeX, XML]. Abstract: Today, a steadily increasing number of users are not just passively consuming Internet content, but also share and publish content. Users publish text, photos and videos. With the availability of 5G high-speed, low-latency mobile broadband networks, real-time video streaming will also be possible. We believe this will become a very popular application in the coming years. But the more popular a service is, the higher the need for resilience. In this paper, we introduce our work-in-progress live video streaming platform for future mobile edge computing scenarios, which makes use of MPTCP+IPv6 to support multi-homing for resilience and multi-path transport for load balancing. As a proof of concept, we will show that the platform is (1) compatible with IPv6, (2) utilizes load balancing when possible and (3) provides robustness by network redundancy. Dreibholz, Thomas; Mazumdar, Somnath; Zahid, Feroz; Taherkordi, Amirhosein and Gran, Ernst Gunnar: ``Mobile Edge as Part of the Multi-Cloud Ecosystem: A Performance Study´´ (PDF, 9966 KiB, ), in Proceedings of the 27th Euromicro International Conference on Parallel, Distributed and Network-Based Processing (PDP), pp. 59–66, DOI 10.1109/PDP.2019.00017, ISBN 978-1-7281-1644-0, Pavia, Lombardia/Italy, February 13, 2019, [BibTeX, XML]. Abstract: Cloud computing has revolutionized the way of application usage and deployment: applications run cost-effectively in remote data centers. With the increasing need for mobility and micro-services, particularly with the upcoming 5G mobile broadband networks, there is also a strong demand for mobile edge computing (MEC): applications run in small cloud systems in close proximity to the user, in order to minimize latencies. Both cloud and MEC have their advantages and disadvantages. Combining the two approaches in a unified multi-cloud, consisting of both traditional cloud services provisioned over heterogeneous cloud platforms and MEC systems, has the potential of obtaining the best out of both worlds. However, a comprehensive study is needed to evaluate the performance gains and the overheads involved for real-world cloud applications. In this paper, we introduce a baseline performance evaluation in order to identify the fallacies and pitfalls of combining multiple cloud systems and MEC into a unified MEC-multi-cloud platform. For this purpose, we analyze the basic, application-independent performance metrics of average round-trip time (RTT) and average application payload throughput in a setup consisting of two private and one public cloud systems. This baseline performance analysis confirms the feasibility of MEC-multi-cloud, and provides guidelines for designing an autonomic resource provisioning solutions, in terms of an extension proposed to our existing Melodic middleware platform for multi-cloud applications. Dreibholz, Thomas: ``NEAT Sockets API´´ (TXT, 57 KiB, ), Internet Draft draft-dreibholz-taps-neat-socketapi-04, IETF, Individual Submission, January 19, 2019, [BibTeX, XML]. Abstract: This document describes a BSD Sockets-like API on top of the callback-based NEAT User API. This facilitates porting existing applications to use a subset of NEAT&apos;s functionality. Dreibholz, Thomas: ``NorNet at the University of Sydney: From Simulations to Real-World Internet Measurements for Multi-Path Transport Research´´ (PDF, 17078 KiB, ), Invited Talk at University of Sydney, Sydney, New South Wales/Australia, January 10, 2019, [BibTeX, XML]. Abstract: A large fraction of the communication in the Internet is handled by the Transmission Control Protocol (TCP). Since the first deployments of this protocol more than 30 years ago, the spectrum of applications as well as the structure of the network have developed at a fast pace. For example, today&apos;s network devices, like smartphones and laptops – i.e. particularly many devices in the area of mobile computing – frequently have an interesting property: the existence of multiple IP addresses (IPv4 and/or IPv6). The addresses may even change due to mobility. This property, denoted as multi-homing, can be utilised for multi-path transport, i.e. the simultaneous usage of multiple paths in the network to improve performance. Multi-path transport is a hot topic in the Internet Engineering Task Force (IETF), which is the standardisation organisation for the Internet. This talk provides an overview of the work in the areas of multi-homing and multi-path transport, with focus on the area of the protocols TCP and Stream Control Transmission Protocol (SCTP) with their experimental extensions Multi-Path TCP (MPTCP) and Concurrent Multi-Path Transfer for SCTP (CMT-SCTP). It particularly shows the sequence of research and selected results, beginning from a simple simulation model, via lab setups and small Internet scenarios, up to the large-scale, international testbed project NorNet. NorNet, and particularly its landline network part NorNet Core, is furthermore described in some detail. Based on NorNet, it is finally possible to validate simulation results in real-world, multi-homed networks, in order to provide valuable input to the ongoing IETF standardisation processes of MPTCP and CMT-SCTP. Particularly, it will also show how the NorNet testbed can be utilised for research at the University of Sydney. Tan, Qining; Yang, Xuelei; Zhao, Lan; Zhou, Xing and Dreibholz, Thomas: ``A Statistic Procedure to Find Formulae for Buffer Size in MPTCP´´ (PDF, 1747 KiB, ), in Proceedings of the 3rd IEEE Advanced Information Technology, Electronic and Automation Control Conference (IAEAC), pp. 900–907, DOI 10.1109/IAEAC.2018.8577570, ISBN 978-1-5386-4509-3, Chongqing/People&apos;s Republic of China, October 13, 2018, [BibTeX, XML]. Abstract: It has been shown that the Multi-Path Transmission Control Protocol (MPTCP) can improve throughput, robustness and resilience of network transport. This paper seeks to discover the relationship of buffer size with throughput and congestion control algorithms, based on the statistical predictive modelling method. In spite of rapid growth of the implementations of MPTCP, the theoretical and fundamental question –- how large the buffer size of MPTCP should be to meet the network traffic -– remains unaddressed, although there were graphic illustrations and descriptive discussions about it. Barik, Runa; Welzl, Michael; Elmokashfi, Ahmed Mustafa; Dreibholz, Thomas and Gjessing, Stein: ``Can WebRTC QoS Work? A DSCP Measurement Study´´ (PDF, 318 KiB, ), in Proceedings of the 30th International Teletraffic Congress (ITC), pp. 167–175, DOI 10.1109/ITC30.2018.00034, ISBN 978-0-9883045-5-0, Wien/Austria, September 6, 2018, [BibTeX, XML]. Abstract: DiffServ was designed to implement service provider quality of service (QoS) policies, where ingress and egress routers change the DiffServ Code Point (DSCP) in the IP header. However, nowadays, applications are beginning to directly set the DSCP themselves, in the hope that this will yield a more appropriate service for their respective video, audio and data streams. WebRTC is a prime example of such an application. As a first step towards understanding whether "WebRTC QoS works", we measured, for both IPv4 and IPv6, what happens to DSCP values along Internet paths. Our study is based on end-to-end measurements from 160 IPv4 and 65 IPv6 geographically spread controlled probe clients to 34 IPv4 and 18 IPv6 servers respectively. Clearly, when the DSCP value is changed, the net result may not be what the application desired. We find that this happens often, and conclude with recommendations on how to improve WebRTC and other applications using the DSCP. Dreibholz, Thomas: ``Big Data Applications on Multi-Clouds: An Introduction to the MELODIC Project´´ (PDF, 11377 KiB, ), Keynote Talk at Hainan University, College of Information Science and Technology (CIST), Haikou, Hainan/People&apos;s Republic of China, December 29, 2017, [BibTeX, XML]. Abstract: In former times, it was necessary to operate and maintain powerful personal computers to run applications. Nowadays, many "normal" users just use laptops, tablet PCs or smartphones. Their applications are powered by cloud systems in the background, which are operated in data centres at remote locations and being connected over the Internet. This presentation first introduces the basics of cloud computing: virtualisation, virtual machines, containers, and software as a service. A challenge of using cloud computing is to deploy services to cloud providers, in order to operate them in a cost-efficient way while providing the best application experience to the users. The vision of the Multi-Cloud Execution-Ware for Large-scale Optimised Data-Intensive Computing (MELODIC) project is to enable federated cloud computing for data-intensive applications. Furthermore, it provides the user with an easy-to-use, unified cloud environment, which hides the complexity of a multi-cloud. The second part of this presentation therefore provides an overview of the basic ideas and application use cases of MELODIC. Dreibholz, Thomas: ``Combining NorNet Core with MELODIC´´ (PDF, 10777 KiB, ), Invited Talk at Hainan University, College of Information Science and Technology (CIST), Haikou, Hainan/People&apos;s Republic of China, December 29, 2017, [BibTeX, XML]. Abstract: This talk gives a short overview over the possibilities of testing applications in the NorNet infrastructure. Furthermore, it presents a short overview of the ongoing work on integrating NorNet Core with the MELODIC multi-cloud infrastructure, including the NorNet Core setup at Hainan University and the Haikou College of Economics. Dreibholz, Thomas: ``NEAT Tutorial at Hainan University: Getting Started with NEAT´´ (PDF, 3199 KiB, ), Invited Talk at Hainan University, College of Information Science and Technology (CIST), Haikou, Hainan/People&apos;s Republic of China, December 18, 2017, [BibTeX, XML]. Dreibholz, Thomas: ``NorNet Core Beginner Tutorial at Hainan University´´ (PDF, 6963 KiB, ), Tutorial at Hainan University, College of Information Science and Technology (CIST), Haikou, Hainan/People&apos;s Republic of China, December 15, 2017, [BibTeX, XML]. Abstract: This tutorial – presented for students at the College of Information Science and Technology (CIST) at Hainan University – provides an introduction on how to get access to the NorNet Core testbed as well as how to run experiments in the testbed. Dreibholz, Thomas: ``An Introduction to Multi-Path Transport at Hainan University´´ (PDF, 17946 KiB, ), Keynote Talk at Hainan University, College of Information Science and Technology (CIST), Haikou, Hainan/People&apos;s Republic of China, December 14, 2017, [BibTeX, XML]. Abstract: A large fraction of the communication in the Internet is handled by the Transmission Control Protocol (TCP). Since the first deployments of this protocol more than 30 years ago, the spectrum of applications as well as the structure of the network have developed at a fast pace. For example, today&apos;s network devices, like smartphones and laptops – i.e. particularly many devices in the area of mobile computing – frequently have an interesting property: the existence of multiple IP addresses (IPv4 and/or IPv6). The addresses may even change due to mobility. This property, denoted as multi-homing, can be utilised for multi-path transport, i.e. the simultaneous usage of multiple paths in the network to improve performance. Multi-path transport is a hot topic in the Internet Engineering Task Force (IETF), which is the standardisation organisation for the Internet. This talk provides an overview of the work in the areas of multi-homing and multi-path transport, with focus on the area of the protocols TCP and Stream Control Transmission Protocol (SCTP) with their experimental extensions Multi-Path TCP (MPTCP) and Concurrent Multi-Path Transfer for SCTP (CMT-SCTP). It particularly shows the sequence of research and selected results, beginning from a simple simulation model, via lab setups and small Internet scenarios, up to the large-scale, international testbed project NorNet. NorNet, and particularly its landline network part NorNet Core, is furthermore described in some detail. Based on NorNet, it is finally possible to validate simulation results in real-world, multi-homed networks, in order to provide valuable input to the ongoing IETF standardisation processes of MPTCP and CMT-SCTP. Particularly, it will also show how the NorNet testbed can be utilised for research at Hainan University. Dreibholz, Thomas: ``Testing Applications with the NorNet Infrastructure´´ (PDF, 11995 KiB, ), in Proceedings of the MELODIC Plenary Meeting, Warszawa, Masovia/Poland, September 21, 2017, [BibTeX, XML]. Abstract: This talk gives a short overview over the possibilities of testing applications in the NorNet infrastructure. Furthermore, it presents a short overview of the ongoing work on integrating NorNet Core with the MELODIC multi-cloud infrastructure. Weinrank, Felix; Grinnemo, Karl-Johan; Bozakov, Zdravko; Brunström, Anna; Dreibholz, Thomas; Hurtig, Per; Khademi, Naeem and Tüxen, Michael: ``A NEAT Way to Browse the Web´´ (PDF, 417 KiB, ), Demo Presentation, in Proceedings of the ACM, IRTF and ISOC Applied Networking Research Workshop (ANRW), pp. 33–34, DOI 10.1145/3106328.3106335, ISBN 978-1-4503-5108-9, Praha/Czech Republic, July 15, 2017, [BibTeX, XML]. Abstract: There is a growing concern that the Internet transport layer has become ossified in the face of emerging novel applications, and that further evolution has become very difficult. The NEAT system is a novel and evolvable transport system that decouples applications from the underlying transport layer and network services. In so doing, it facilitates dynamic transport selection. This demo shows how the NEAT system is able to dynamically select the most appropriate transport solution for the Mozilla Firefox web browser. Dreibholz, Thomas: ``Multi-Path Transport at Hainan University – From Simulations to Real-World Internet Measurements in the NorNet Testbed´´ (PDF, 14797 KiB, ), Keynote Talk at Hainan University, College of Information Science and Technology (CIST), Haikou, Hainan/People&apos;s Republic of China, April 18, 2017, [BibTeX, XML]. Dreibholz, Thomas: ``The Basics of Using the NorNet Core Testbed at Hainan University´´ (PDF, 4987 KiB, ), Tutorial at Hainan University, College of Information Science and Technology (CIST), Haikou, Hainan/People&apos;s Republic of China, April 18, 2017, [BibTeX, XML]. Dreibholz, Thomas: ``A Practical Introduction to NEAT at Hainan University´´ (PDF, 866 KiB, ), Invited Talk at Hainan University, College of Information Science and Technology (CIST), Haikou, Hainan/People&apos;s Republic of China, April 17, 2017, [BibTeX, XML]. Dreibholz, Thomas; Ferlin, Simone; Alay, Özgü; Elmokashfi, Ahmed Mustafa; Livadariu, Ioana Alexandrina and Zhou, Xing: ``MPTCP Experiences in the NorNet Testbed´´ (TXT, 24 KiB, ), Internet Draft draft-dreibholz-mptcp-nornet-experience-04, IETF, Individual Submission, March 30, 2017, [BibTeX, XML]. Abstract: This document collects some experiences of Multi-Path TCP (MPTCP) evaluations in the NorNet testbed. Wang, Kun; Dreibholz, Thomas; Zhou, Xing; Fu, Fa; Tan, Yuyin; Cheng, Xi and Tan, Qining: ``On the Path Management of Multi-Path TCP in Internet Scenarios based on the NorNet Testbed´´ (PDF, 379 KiB, ), in Proceedings of the IEEE International Conference on Advanced Information Networking and Applications (AINA), pp. 1–8, DOI 10.1109/AINA.2017.29, ISBN 978-1-5090-6028-3, Taipei, Taiwan/People&apos;s Republic of China, March 27, 2017, [BibTeX, XML]. Abstract: With the rapid development of Internet communications, there is a growing demand to support devices being connected to multiple Internet service providers simultaneously. For example, every modern smartphone already provides at least mobile broadband (UMTS, LTE) as well as Wi-Fi interfaces. This multi-homing property can be used for resilience, but there is also an increasing interest in making use of concurrent multi-path transport. That is, multiple network paths can be utilised simultaneously, in order to improve the payload throughput for applications like big data or cloud computing. In this paper, we examine the performance of multi-path transport in real-world Internet setups, based on Multi-Path TCP (MPTCP) in the NorNet testbed for multi-homed systems. However, systems in such challenging setups need proper configuration. Therefore, we particularly would like to highlight the performance impact of different path management and congestion control settings in such realistic scenarios. Zhou, Feng; Dreibholz, Thomas; Zhou, Xing; Fu, Fa; Tan, Yuyin and Gan, Quan: ``The Performance Impact of Buffer Sizes for Multi-Path TCP in Internet Setups´´ (PDF, 1006 KiB, ), in Proceedings of the IEEE International Conference on Advanced Information Networking and Applications (AINA), pp. 9–16, DOI 10.1109/AINA.2017.26, ISBN 978-1-5090-6028-3, Taipei, Taiwan/People&apos;s Republic of China, March 27, 2017, [BibTeX, XML]. Abstract: The Multi-Path Transmission Control Protocol (MPTCP) is the new concurrent multi-path transfer extension for the widely-deployed Transmission Control Protocol (TCP). Of course, having multiple and possibly highly dissimilar paths for transmission is a challenge for the management of the send and receive buffers, since optimal throughput is desired with a reasonable allocation of the limited memory resources in MPTCP endpoints. This is particularly important when many MPTCP connections have to be handled simultaneously. This paper measures out the required MPTCP buffer size in the real-world Internet testbed NorNet, comparing theoretical size and real size to analyse MPTCP performance. The experiment shows that multi-path transmission can effectively increase the application payload throughput, and greatly improve the robustness of the data transmission. As an important point of this paper, we can show that appropriate buffer size settings can increase the payload throughput, while not wasting resources. This paper has certain significance for further accurately determining the optimal buffer size settings for multi-path transmission in large-scale Internet setups. Dreibholz, Thomas: ``An Experiment Tutorial for the NorNet Core Testbed at the the Universidad de Castilla-La Mancha´´ (PDF, 5244 KiB, ), Tutorial at the Universidad de Castilla-La Mancha, Instituto de Investigación Informática de Albacete, Albacete, Castilla-La Mancha/Spain, February 16, 2017, [BibTeX, XML]. Abstract: This tutorial – presented for staff members and students at the Instituto de Investigación Informática de Albacete of the the Universidad de Castilla-La Mancha – provides an introduction on how to get access to the NorNet Core testbed as well as how to run experiments in the testbed. Dreibholz, Thomas: ``Multi-Path Transport – From Simulations to Real-World Internet Measurements´´ (PDF, 14631 KiB, ), Keynote Talk at the Universidad de Castilla-La Mancha, Instituto de Investigación Informática de Albacete, Albacete, Castilla-La Mancha/Spain, February 16, 2017, [BibTeX, XML]. Abstract: A large fraction of the communication in the Internet is handled by the Transmission Control Protocol (TCP). Since the first deployments of this protocol more than 30 years ago, the spectrum of applications as well as the structure of the network have developed at a fast pace. For example, today&apos;s network devices, like smartphones and laptops – i.e. particularly many devices in the area of mobile computing – frequently have an interesting property: the existence of multiple IP addresses (IPv4 and/or IPv6). The addresses may even change due to mobility. This property, denoted as multi-homing, can be utilised for multi-path transport, i.e. the simultaneous usage of multiple paths in the network to improve performance. Multi-path transport is a hot topic in the Internet Engineering Task Force (IETF), which is the standardisation organisation for the Internet. This talk provides an overview of the work in the areas of multi-homing and multi-path transport, with focus on the area of the protocols TCP and Stream Control Transmission Protocol (SCTP) with their experimental extensions Multi-Path TCP (MPTCP) and Concurrent Multi-Path Transfer for SCTP (CMT-SCTP). It particularly shows the sequence of research and selected results, beginning from a simple simulation model, via lab setups and small Internet scenarios, up to the large-scale, international testbed project NorNet. NorNet, and particularly its landline network part NorNet Core, is furthermore described in some detail. Based on NorNet, it is finally possible to validate simulation results in real-world, multi-homed networks, in order to provide valuable input to the ongoing IETF standardisation processes of MPTCP and CMT-SCTP. Dreibholz, Thomas: ``Multi-Path Transport with OMNeT++ and the INET Framework´´ (PDF, 4367 KiB, ), Invited Talk at the Universidad de Castilla-La Mancha, Instituto de Investigación Informática de Albacete, Albacete, Castilla-La Mancha/Spain, February 16, 2017, [BibTeX, XML]. Abstract: In order to evaluate the performance of multi-path transport protocols, a straightforward initial step is to perform simulations. OMNeT++, together with the INET Framework, provide a powerful Open Source platform for running network simulations. This talk provides an overview of simulating multi-path transport with OMNeT++ and the INET Framework. Particular focus is on the Concurrent Multipath Transfer extension for the Stream Control Transmission Protocol (SCTP). Furthermore, useful additions like the NetPerfMeter application model, the extended network auto-configurator as well as the Simulation Processing Tool-Chain (SimProcTC) are explained. Dreibholz, Thomas: ``An Experiment Tutorial for the NorNet Core Testbed at the University of Sydney´´ (PDF, 4829 KiB, ), Tutorial at University of Sydney, School of Information Technologies, Sydney, New South Wales/Australia, January 24, 2017, [BibTeX, XML]. Abstract: This tutorial – presented for Ph.D. students at the School of Information Technologies of the University of Sydney – provides an introduction on how to get access to the NorNet Core testbed as well as how to run experiments in the testbed. Dreibholz, Thomas: ``NorNet at the University of Sydney – An Introduction to the NorNet Core Testbed´´ (PDF, 11848 KiB, ), Invited Talk at University of Sydney, School of Information Technologies, Sydney, New South Wales/Australia, January 24, 2017, [BibTeX, XML]. Abstract: Multi-homing denotes the simultaneous connection of endpoints (e.g. cloud servers, smartphones, etc.) to multiple Internet Service Providers (ISP). That is, the endpoints remain reachable even when some of the ISPs have problems (e.g. malfunction of hardware or break of cables). Besides the redundancy aspect, multi-homing can also make load sharing by multi-path transport possible, i.e. increasing the application throughput by utilising multiple paths simultaneously. Multi-path transport can e.g. be realised by Concurrent Multi-Path Transfer for SCTP (CMT-SCTP) and Multi-Path TCP (MPTCP), two protocols that are currently under standardisation in the IETF. The growing need for and deployment of multi-homed applications makes large-scale testing and evaluation in realistic Internet setups necessary. For instance, different paths can have very different characteristics with regard to bandwidth, packet loss rate, congestion, delay and jitter. Therefore, the NorNet project of the Simula Research Laboratory is building up an open platform for such experiments: the NorNet testbed. It provides programmable nodes with multiple ISP connections – wired as well as wireless – that are distributed all over Norway as well as some international locations. This talk will give an overview over NorNet&apos;s wired network part NorNet Core. Particularly, it will also show how the NorNet Core testbed can be utilised for research at the University of Sydney. Dreibholz, Thomas: ``NorNet – Building an Inter-Continental Internet Testbed based on Open Source Software´´ (PDF, 9587 KiB, ), in Proceedings of the LinuxCon Europe, Berlin/Germany, October 5, 2016, [BibTeX, XML]. Abstract: NorNet is an open, international Internet testbed platform for research on multi-homed systems. Multi-homed systems have the property of being connected to multiple Internet Service Providers (ISP) simultaneously, in order to still provide connectivity in case of ISP/network failures. Basis of NorNet is Linux, together with other Open Source software. At the moment, the testbed infrastructure spreads over 21 sites on 4 continents. NorNet makes extensive use of advanced Linux features like virtualisation, file system features, routing rules, SCTP, MPTCP, and more. The global distribution creates further challenges. Goal of this talk is therefore to provide an overview of the problems that occurred when building the testbed, as well as solutions and lessons learned from solving these challenges. The idea is to present guidelines for utilising the advanced Linux features in own projects. Yedugundla, Kiran Venkata; Ferlin, Simone; Dreibholz, Thomas; Alay, Özgü; Kuhn, Nicolas; Hurtig, Per and Brunström, Anna: ``Is Multi-Path Transport Suitable for Latency Sensitive Traffic?´´ (PDF, 4525 KiB, ), in Computer Networks, vol. 105, pp. 1–21, Elsevier, DOI 10.1016/j.comnet.2016.05.008, ISSN 1389-1286, August 4, 2016, [BibTeX, XML]. Abstract: This paper assesses whether multi-path communication can help latency-sensitive applications to satisfy the requirements of their users. We consider Concurrent Multi-path Transfer for SCTP (CMT-SCTP) and Multi-Path TCP (MPTCP) and evaluate their proficiency in transporting video, gaming, and web traffic over combinations of WLAN and 3G interfaces. To ensure the validity of our evaluation, several experimental approaches were used including simulation, emulation and live experiments. When paths are symmetric in terms of capacity, delay and loss rate, we find that the experienced latency is significantly reduced, compared to using a single path. Using multiple asymmetric paths does not affect latency – applications do not experience any increase or decrease, but might benefit from other advantages of multi-path communication. In the light of our conclusions, multi-path transport is suitable for latency-sensitive traffic and mature enough to be widely deployed. Dreibholz, Thomas: ``NorNet – The Internet Testbed for Multi-Homed Systems´´ (PDF, 11198 KiB, ), in Proceedings of the Multi-Service Networks Conference (MSN, Coseners), Abingdon, Oxfordshire/United Kingdom, July 8, 2016, [BibTeX, XML]. Abstract: Multi-homing denotes the simultaneous connection of endpoints (e.g. cloud servers, smartphones, etc.) to multiple Internet Service Providers (ISP). That is, the endpoints remain reachable even when some of the ISPs have problems (e.g. malfunction of hardware or break of cables). Besides the redundancy aspect, multi-homing can also make load sharing by multi-path transport possible, i.e. increasing the application throughput by utilising multiple paths simultaneously. Multi-path transport can e.g. be realised by Concurrent Multi-Path Transfer for SCTP (CMT-SCTP) and Multi-Path TCP (MPTCP), two protocols that are currently under standardisation in the IETF. The growing need for and deployment of multi-homed applications makes large-scale testing and evaluation in realistic Internet setups necessary. For instance, different paths can have very different characteristics with regard to bandwidth, packet loss rate, congestion, delay and jitter. Therefore, the NorNet project of the Simula Research Laboratory is building up an open platform for such experiments: the NorNet testbed. It provides programmable nodes with multiple ISP connections – wired as well as wireless – that are distributed all over Norway as well as some international locations. This talk will give an overview over NorNet. Dreibholz, Thomas: ``An Experiment Tutorial for the NorNet Core Testbed at Hainan University´´ (PDF, 5054 KiB, ), Tutorial at Hainan University, College of Information Science and Technology (CIST), Haikou, Hainan/People&apos;s Republic of China, May 29, 2016, [BibTeX, XML]. Dreibholz, Thomas: ``NorNet at Hainan University – An Introduction to the NorNet Testbed´´ (PDF, 13828 KiB, ), Invited Talk at Hainan University, College of Information Science and Technology (CIST), Haikou, Hainan/People&apos;s Republic of China, May 29, 2016, [BibTeX, XML]. Abstract: Multi-homing denotes the simultaneous connection of endpoints (e.g. cloud servers, smartphones, etc.) to multiple Internet Service Providers (ISP). That is, the endpoints remain reachable even when some of the ISPs have problems (e.g. malfunction of hardware or break of cables). Besides the redundancy aspect, multi-homing can also make load sharing by multi-path transport possible, i.e. increasing the application throughput by utilising multiple paths simultaneously. Multi-path transport can e.g. be realised by Concurrent Multi-Path Transfer for SCTP (CMT-SCTP) and Multi-Path TCP (MPTCP), two protocols that are currently under standardisation in the IETF. The growing need for and deployment of multi-homed applications makes large-scale testing and evaluation in realistic Internet setups necessary. For instance, different paths can have very different characteristics with regard to bandwidth, packet loss rate, congestion, delay and jitter. Therefore, the NorNet project of the Simula Research Laboratory is building up an open platform for such experiments: the NorNet testbed. It provides programmable nodes with multiple ISP connections – wired as well as wireless – that are distributed all over Norway as well as some international locations. This talk will give an overview over NorNet. Particularly, it will also show how the NorNet testbed can be utilised for research at Hainan University. Ferlin, Simone; Alay, Özgü; Hayes, David Andrew; Dreibholz, Thomas and Welzl, Michael: ``Revisiting Congestion Control for Multipath TCP with Shared Bottleneck Detection´´ (PDF, 1440 KiB, ), in Proceedings of the 35th IEEE International Conference on Computer Communications (INFOCOM), pp. 2419–2427, ISBN 978-1-4673-9953-1, San Francisco, California/U.S.A., April 14, 2016, [BibTeX, XML]. Abstract: Multipath TCP (MPTCP) enables the simultaneous usage of multiple links for bandwidth aggregation, better resource utilization and improved reliability. Its coupled congestion control intends to reap the increased bandwidth of multiple links, while avoiding to be more aggressive than regular TCP flows on every used link. We argue that this leads to a very conservative behavior when paths do not share a bottleneck. Therefore, in this paper, we first quantify the penalty of the coupled congestion control for the links that do not share a bottleneck. Then, in order to overcome this penalty, we design and implement a practical shared bottleneck detection (SBD) algorithm for MPTCP, namely MPTCP-SBD. Through extensive emulations, we show that MPTCP-SBD outperforms all currently deployed MPTCP coupled congestion controls by accurately detecting bottlenecks resulting in throughput gains of up to 30\% in the absence of shared bottlenecks while remaining fair to TCP in shared bottlenecks scenarios. We complement the emulation results with real-network experiments justifying it is safeness for deployment. Dreibholz, Thomas: ``An Experiment Tutorial for the NorNet Core Testbed at HAW Hamburg´´ (PDF, 4134 KiB, ), Tutorial at Hochschule für Angewandte Wissenschaften Hamburg (HAW Hamburg), Hamburg/Germany, March 22, 2016, [BibTeX, XML]. Abstract: This tutorial – presented at the Hochschule für Angewandte Wissenschaften Hamburg (HAW Hamburg) – provides an introduction on how to get access to the NorNet Core testbed as well as how to run experiments in the testbed. Dreibholz, Thomas: ``NorNet at HAW Hamburg – An Introduction to the NorNet Testbed´´ (PDF, 13981 KiB, ), Invited Talk at Hochschule für Angewandte Wissenschaften Hamburg (HAW Hamburg), Hamburg/Germany, March 22, 2016, [BibTeX, XML]. Dreibholz, Thomas: ``An Experiment Tutorial for the NorNet Core Testbed at NICTA´´ (PDF, 4140 KiB, ), Tutorial at National Information Communications Technology Australia (NICTA), Sydney, New South Wales/Australia, January 22, 2016, [BibTeX, XML]. Abstract: This tutorial – presented at National Information Communications Technology Australia (NICTA) – provides an introduction on how to get access to the NorNet Core testbed as well as how to run experiments in the testbed. Dreibholz, Thomas: ``NorNet at NICTA – An Introduction to the NorNet Testbed´´ (PDF, 13403 KiB, ), Invited Talk at National Information Communications Technology Australia (NICTA), Sydney, New South Wales/Australia, January 22, 2016, [BibTeX, XML]. Fu, Fa; Zhou, Xing; Dreibholz, Thomas; Wang, Keying; Zhou, Feng and Gan, Quan: ``Performance Comparison of Congestion Control Strategies for Multi-Path TCP in the NorNet Testbed´´ (PDF, 172 KiB, ), in Proceedings of the 4th IEEE/CIC International Conference on Communications in China (ICCC), pp. 607–612, DOI 10.1109/ICCChina.2015.7448667, ISBN 978-1-5090-0243-6, Shenzhen, Guangdong/People&apos;s Republic of China, November 3, 2015, [BibTeX, XML]. Abstract: Multi-path transport has become a hot topic in Internet protocol research with the evolution of emerging technologies, particularly with the market penetration of access terminals having multiple network interfaces (e.g. smartphones with LTE/UMTS and Wi-Fi interfaces). Multi-Path TCP (MPTCP) is an extension of TCP that allows a connection to create several subflows for utilizing multiple network paths. Using multiple end-to-end TCP connections as subflows, MPTCP distributes data to different subflows over multiple ISPs, so as to enhance network robustness and improve throughput. This paper first presents MPTCP’s architecture and multi-path congestion control algorithm concepts. Then, it examines three test scenarios in the NorNet testbed, particularly highlighting the performance difference between using uncoupled and coupled congestion controls in multi-homed, real-world Internet setups. The results show that MPTCP with coupled CCs gets more benefits than TCP and demonstrates the lower aggressiveness in comparison to MPTCP with uncoupled CCs. Dreibholz, Thomas: ``NetPerfMeter: A Network Performance Metering Tool´´ (HTML, 20 KiB, ), in Multipath TCP Blog, September 7, 2015, [BibTeX, XML]. Abstract: A common problem for evaluating multiple transport protocols in a multi-platform environment is to have a test tool that is capable to run in all these environments, and – of course – to support all necessary protocols. Using different evaluation tools is not a good solution, since each tool may introduce its own – and possibly incompatible – parametrisation scheme. In order to overcome this problem, originally for the use case of evaluating the Stream Control Transmission Protocol (SCTP) and compare it to the Transmission Control Protocol (TCP), NetPerfMeter has been designed and developed. This blog article provides an introduction to NetPerfMeter. Adhari, Hakim; Dreibholz, Thomas; Werner, Sebastian and Rathgeb, Erwin Paul: ``Eclipse: A New Dynamic Delay-based Congestion Control Algorithm for Background Traffic´´ (PDF, 1082 KiB, ), in Proceedings of the 18th International Conference on Network-Based Information Systems (NBiS), pp. 115–123, DOI 10.1109/NBiS.2015.21, ISBN 978-1-4799-9942-2, Taipei/Taiwan, September 2, 2015, [BibTeX, XML]. Awarded with the Best Paper Award. Abstract: Initially, the Internet transport protocol TCP has been designed to provide a ``best effort&apos;&apos; service: it is meant to share the network resources with other users and applications. However, there is nowadays also a growing demand for transmitting big amounts of data in the background, namely background transport that uses spare capacity, but with minimal effect on other traffic. For instance, systems can proactively download content that the user/system would need in the future (e.g. update packages, video files, etc.). Efforts have therefore been made in the IETF for the sake of such a service with Low Extra Delay Background Traffic (LEDBAT) congestion control. While LEDBAT works in some cases, there are however known situations where it causes serious performance problems, particularly in combination with the ubiquitous bufferbloat for example in current broadband networks. In this paper, we analyse the issues of LEDBAT and propose a new approach for background traffic. Inspired by an astronomical event, we have named this approach Eclipse. Unlike LEDBAT, Eclipse can dynamically adapt to the network characteristics not only to minimise the additional network delay but also to maximise the utilisation of spare network capacity. We will show the usefulness of Eclipse by simulations. Dreibholz, Thomas: ``The NorNet Core Testbed: A Status Update for the NNUW-3´´ (PDF, 12120 KiB, ), in Proceedings of the 3rd International NorNet Users Workshop (NNUW-3), Fornebu, Akershus/Norway, August 28, 2015, [BibTeX, XML]. Abstract: This talk provides an update on the NorNet Core testbed development and research for the 3rd NorNet Users Workshop (NNUW-3) in August 2015. Dreibholz, Thomas: ``MPTCP Experiences in the NorNet Testbed: draft-dreibholz-mptcp-nornet-experience-01´´ (PDF, 12798 KiB, ), in Proceedings of the 93th IETF Meeting, Praha/Czech Republic, July 21, 2015, [BibTeX, XML]. Abstract: This presentation gives an overview of the Multi-Path TCP (MPTCP) experiences from recent research in the NorNet testbed. Livadariu, Ioana Alexandrina; Ferlin, Simone; Alay, Özgü; Dreibholz, Thomas; Dhamdhere, Amogh and Elmokashfi, Ahmed Mustafa: ``Leveraging the IPv4/IPv6 Identity Duality by using Multi-Path Transport´´ (PDF, 327 KiB, ), in Proceedings of the 18th IEEE Global Internet Symposium (GI) at the 34th IEEE Conference on Computer Communications (INFOCOM), pp. 312–317, DOI 10.1109/INFCOMW.2015.7179403, ISBN 978-1-4673-7131-5, Hong Kong/People&apos;s Republic of China, April 27, 2015, [BibTeX, XML]. Abstract: With the 20th anniversary of IPv6 nearing quickly, a growing number of Internet service providers (ISPs) now offer their customers both IPv6 and IPv4 connectivity. This makes multi-homing with IPv4 and IPv6 increasingly common even with just a single ISP connection. Furthermore, the growing popularity of multi-path transport, especially Multi-Path TCP (MPTCP) that is the extension of the well-known Transmission Control Protocol (TCP), leads to the question of whether this identity duality can be utilized for improving application performance in addition to providing resilience. In this paper, we first investigate the AS-level congruency of IPv4 and IPv6 paths in the Internet. We find that more than 60\% of the current IPv4 and IPv6 AS-paths are non-congruent at the AS-level, which motivates us to explore how MPTCP can utilize the IPv4/IPv6 identity duality to improve data transfer performance. Our results show that MPTCP, even with a single dual-stack Internet connection, can significantly improve the end-to-end performance when the underlying paths are non-congruent. The extent of the improvement can reach up to the aggregate of the IPv4 and IPv6 bandwidth. Dreibholz, Thomas; Bjørgeengen, Jarle and Werme, Jonas: ``Monitoring and Maintaining the Infrastructure of the NorNet Testbed for Multi-Homed Systems´´ (PDF, 538 KiB, ), in 5th International Workshop on Protocols and Applications with Multi-Homing Support (PAMS), pp. 611–616, DOI 10.1109/WAINA.2015.76, ISBN 978-1-4799-1775-4, Gwangju/South Korea, March 25, 2015, [BibTeX, XML]. Abstract: NorNet Core is the world&apos;s first, open, large-scale Internet testbed for multi-homed systems and applications. Particularly, it is currently used for research on topics like multi-path transport and resilience. Researchers can run experiments on distributed, programmable nodes that are distributed over various locations and providing access to multiple different Internet service providers (ISP) with different access technologies. Clearly, a key feature of this testbed is to work in the real-world Internet. That is, it is especially desired to expose experiments to real Internet behaviour like background traffic. However, for the researcher, it is necessary to actually know how paths – being used for an experiment – actually behave: Are the paths actually working? How are the round-trip times among sites over different ISPs, etc.. How did the behaviour change over time? To provide such information to the researchers, we have designed and developed a maintenance and monitoring infrastructure for the NorNet Core testbed. In this paper, we will first introduce this infrastructure. Furthermore, we will demonstrate its usefulness with some useful, real-world examples. Our infrastructure has now become part of the testbed, and it is therefore available for all users of NorNet Core as well. Dreibholz, Thomas; Zhou, Xing and Fu, Fa: ``Multi-Path TCP in Real-World Setups – An Evaluation in the NorNet Core Testbed´´ (PDF, 211 KiB, ), in 5th International Workshop on Protocols and Applications with Multi-Homing Support (PAMS), pp. 617–622, DOI 10.1109/WAINA.2015.74, ISBN 978-1-4799-1775-4, Gwangju/South Korea, March 25, 2015, [BibTeX, XML]. Abstract: Nowadays, cloud applications are becoming more and more popular. However, in order for such applications to work, they need a stable Internet connectivity. To avoid the Internet access becoming a single point of failure, redundancy by multi-homing – i.e. simultaneous access to multiple Internet service providers (ISP) – is becoming increasingly common as well. Multi-homing leads to the desire to utilise all network attachment points simultaneously, which is e.g. provided by the Multi-Path TCP (MPTCP) extension for TCP. 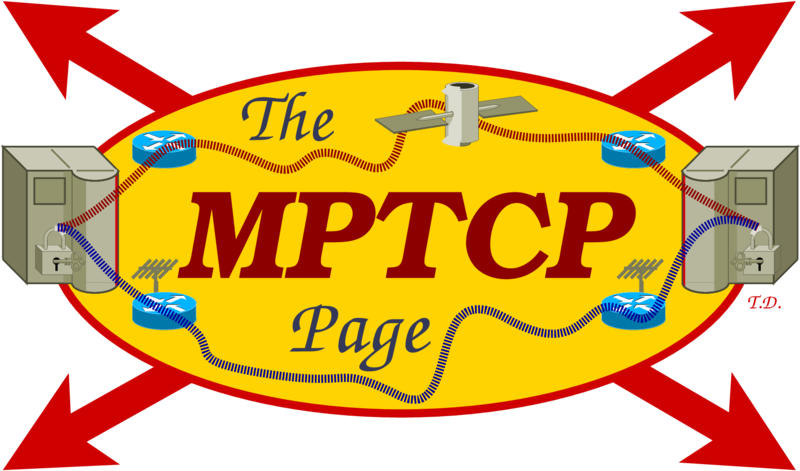 MPTCP is still under development by researchers and standardisation in the IETF. Particularly, it is necessary to evaluate MPTCP under realistic Internet conditions. NorNet Core is the world&apos;s first, large-scale Internet testbed for multi-homed systems and applications. It is therefore a useful platform for evaluating MPTCP. In this paper, we therefore present our NorNet Core extension that adds MPTCP support to the testbed. Particularly, our extension is now available to all users of NorNet Core as well, which significantly reduces the effort of MPTCP researchers to evaluate MPTCP and its improvements. In a proof of concept, we furthermore show the strengths and weaknesses of state-of-the-art MPTCP in NorNet Core, in a configuration covering 29 ISP connections at 14 sites in 5 different countries. Ferlin, Simone; Dreibholz, Thomas and Alay, Özgü: ``Multi-Path Transport over Heterogeneous Wireless Networks: Does it really pay off?´´ (PDF, 986 KiB, ), in Proceedings of the IEEE Global Communications Conference (GLOBECOM), pp. 4807–4813, DOI 10.1109/GLOCOM.2014.7037567, ISBN 978-1-4799-3512-3, Austin, Texas/U.S.A., December 11, 2014, [BibTeX, XML]. Abstract: Multi-path transfer protocols such as Concurrent Multi-Path Transfer for SCTP and Multi-Path TCP (MPTCP), are becoming increasingly popular due to widespread deployment of smartphones with multi-homing support. Although the idea of using multiple interfaces simultaneously to improve application throughput is tempting, does transmission over multiple interfaces always provide benefits especially in realistic setup? In this paper, we first show that multi-path transfer might actually have a negative impact in real-world scenarios with mobile broadband and wireless LAN networks. We then introduce our Dynamic Relative Path Scoring (DRePaS) algorithm that continuously evaluates the contribution of paths to the overall performance and dynamically influences the scheduling decisions to make best use of the paths for the overall system performance. We show that DRePaS outperforms the current MPTCP implementation in terms of throughput and application delay, especially when the links are heterogeneous. Dreibholz, Thomas; Simonsen, Henrik Vest and Gran, Ernst Gunnar: ``A Demonstration of the NorNet Core Research Testbed for Multi-Homed Systems´´ (PDF, 60 KiB, ), Demo Presentation at the IEEE Global Communications Conference (GLOBECOM), Austin, Texas/U.S.A., December 9, 2014, [BibTeX, XML]. Abstract: This abstract describes a demonstration proposal for the NorNet Core testbed for multi-homed systems. Golkar, Forough; Dreibholz, Thomas and Kvalbein, Amund: ``Measuring and Comparing Internet Path Stability in IPv4 and IPv6´´ (PDF, 436 KiB, ), in Proceedings of the 5th IEEE International Conference on the Network of the Future (NoF), pp. 1–5, DOI 10.1109/NOF.2014.7119767, ISBN 978-1-4799-7531-0, Paris/France, December 4, 2014, [BibTeX, XML]. Awarded with the Best Paper Award. Abstract: In just about 4 years, IPv6 will celebrate its 20th anniversary. While the protocol itself is already quite old, its deployment has only recently picked up speed. Not so many Internet service providers offer direct IPv6 connectivity to their customers, yet. Clearly, when IPv6 is available to customers, they expect that IPv6 offers at least the same – or even better – stability of connections in comparison to IPv4. The main goal of this paper is to investigate whether this is true today. In our paper, we present up-to-date measurement results on the stability of IPv4 and IPv6 paths in the real Internet, based on machines that are distributed over a large geographical area, as part of the NorNet Core testbed infrastructure for multi-homed systems. The measurements not only cover high-speed research networks, but also consumer-grade ADSL connections – i.e. the ISP connection types of "normal" end-users – as well as a broad range of different ISPs. The measurements show that IPv6 paths are less stable than corresponding IPv4 paths. We also find that the use of load balancing is more prevalent in IPv6 than in IPv4. Dreibholz, Thomas: ``An Experiment Tutorial for the NorNet Core Testbed at Hainan University´´ (PDF, 2148 KiB, ), Tutorial at Hainan University, College of Information Science and Technology (CIST), Haikou, Hainan/People&apos;s Republic of China, October 27, 2014, [BibTeX, XML]. Dreibholz, Thomas: ``An Experiment Tutorial for the NorNet Core Testbed´´ (PDF, 6033 KiB, ), in Proceedings of the 2nd International NorNet Users Workshop (NNUW-2), Fornebu, Akershus/Norway, August 29, 2014, [BibTeX, XML]. Abstract: This tutorial provides an introduction on how to get access to the NorNet Core testbed as well as how to run experiments in the testbed. Alay, Özgü; Ferlin, Simone and Dreibholz, Thomas: ``Multipath Transport over Heterogeneous Networks´´ (PDF, 2930 KiB, ), in Proceedings of the 2nd International NorNet Users Workshop (NNUW-2), Fornebu, Akershus/Norway, August 29, 2014, [BibTeX, XML]. Dreibholz, Thomas: ``The NorNet Core Testbed – Introduction and Status in August 2014´´ (PDF, 14850 KiB, ), in Proceedings of the 2nd International NorNet Users Workshop (NNUW-2), Fornebu, Akershus/Norway, August 28, 2014, [BibTeX, XML]. Abstract: This talk provides an introduction to the NorNet Core testbed as well as a status overview on the development and deployment in August 2014. Ferlin, Simone; Dreibholz, Thomas and Alay, Özgü: ``Tackling the Challenge of Bufferbloat in Multi-Path Transport over Heterogeneous Wireless Networks´´ (PDF, 820 KiB, ), in Proceedings of the IEEE/ACM International Symposium on Quality of Service (IWQoS), pp. 123–128, DOI 10.1109/IWQoS.2014.6914310, ISBN 978-1-4799-4852-9, Hong Kong/People&apos;s Republic of China, May 26, 2014, [BibTeX, XML]. Abstract: Today, most of the smart phones are equipped with two network interfaces: Mobile Broadband (MBB) and Wireless Local Area Network (WLAN). Multi-path transport protocols provide increased throughput or reliability, by utilizing these interfaces simultaneously. However, multi-path transmission over networks with very different QoS characteristics is a challenge. In this paper, we studied Multi-Path TCP (MPTCP) in heterogeneous networks, specifically MBB networks and WLAN. We first investigate the effect of bufferbloat in MBB on MPTCP performance. Then, we propose a bufferbloat mitigation algorithm: Multi-Path Transport Bufferbloat Mitigation (MPT-BM). Using our algorithm, we conduct experiments in real operational networks. The experimental results show that MPT-BM outperforms the current MPTCP implementation by increasing the application goodput quality and decreasing MPTCP&apos;s buffer delay, jitter and buffer space requirements. Adhari, Hakim; Werner, Sebastian; Dreibholz, Thomas and Rathgeb, Erwin Paul: ``LEDBAT-MP – On the Application of Lower-than-Best-Effort for Concurrent Multipath Transfer´´ (PDF, 1229 KiB, ), in Proceedings of the 4th International Workshop on Protocols and Applications with Multi-Homing Support (PAMS), DOI 10.1109/WAINA.2014.125, ISBN 978-1-4799-2652-7, Victoria, British Columbia/Canada, May 16, 2014, [BibTeX, XML]. Abstract: The Internet is based on best effort communication, i.e. it tries to deliver packets but does not provide any guarantees. A transport protocol can make use of this best effort service to provide a suitable service to its applications. Also, its congestion control is responsible for a fair distribution of the resources within the Internet. However, background data transfer applications (like file sharing or update fetching) do not require "best effort", they in fact could use a "lower-than-best-effort" service to leave resources to more important applications if needed. For this purpose, the Low Extra Delay Background Transport (LEDBAT) algorithm has been standardized by the IETF. Nowadays, multi-homing is becoming increasingly common in modern networks and several approaches to exploit this feature (e.g. CMT-SCTP, MPTCP) have evolved that are able to combine resources of multiple paths. For background traffic oriented algorithms like LEDBAT, this feature could be of great use, too, i.e. by increasing the overall bandwidth while shifting the transmission away from paths which are used by other flows. This could be particularly useful for non-critical bulk transfers in data centres. In this paper, we introduce our approach LEDBAT for Multi-Path – denoted as LEDBAT-MP – and analyze its performance by simulations. With this paper, we want to highlight some generic design questions and start a discussion on how a solid universal background multi-path congestion control strategy should behave. Ferlin, Simone; Dreibholz, Thomas; Alay, Özgü and Kvalbein, Amund: ``Measuring the QoS Characteristics of Operational 3G Mobile Broadband Networks´´ (PDF, 1524 KiB, ), in Proceedings of the 4th International Workshop on Protocols and Applications with Multi-Homing Support (PAMS), pp. 753–758, DOI 10.1109/WAINA.2014.123, ISBN 978-1-4799-2652-7, Victoria, British Columbia/Canada, May 16, 2014, [BibTeX, XML]. Abstract: Today, many smart phones and tablets have multiple interfaces (i.e. WLAN and 3G). These multiple interfaces can be utilized simultaneously by a multi-path transport protocol to provide bandwidth aggregation or reliability. However, in order to design efficient multi-path scheduling and congestion control strategies, it is crucial to understand the behaviour and properties of the underlying paths first. WLAN links have already been studied extensively in the literature. Therefore, in this paper, we focus on Mobile Broadband (MBB) networks that are in use today. We utilized NorNet Edge nodes that are connected to up to five different 3G ISPs (UMTS and CDMA2000), hence, providing a realistic view on the QoS characteristics that are experienced by end-users of these MBB networks. We present QoS characteristics (e.g. bandwidth, delay and loss) and discuss our observations. Our results shed light on what a multi-path transport endpoint has to expect – and to efficiently cope with – when using today&apos;s MBB networks as transport paths. Dreibholz, Thomas: ``The NorNet Testbed for Multi-Homed Systems – Introduction and Status´´ (PDF, 8480 KiB, ), Invited Talk at Princeton University, Department of Computer Science, Princeton, New Jersey/U.S.A., May 8, 2014, [BibTeX, XML]. Abstract: Multi-homing denotes the simultaneous connection of endpoints to multiple Internet Service Providers (ISP). That is, such endpoints should remain reachable even when some of the ISPs have problems. Besides the redundancy aspect, multi-homing can also make load sharing by multi-path transport possible, i.e. increasing the application throughput by utilizing multiple paths simultaneously. The growing need for and deployment of multi-homed applications makes large-scale testing and evaluation in realistic Internet setups necessary. For instance, different paths can have very different characteristics with regard to bandwidth, packet loss rate, congestion, delay and jitter. Therefore, the Simula Research Laboratory is building up the NorNet testbed, which is an open platform for such experiments. NorNet consists of two parts, the wireless part NorNet Edge as well as the wired part NorNet Core, providing researchers the possibility to use programmable, multi-homed nodes at different locations in Norway as well as at some international sites. This talk gives an overview over the NorNet testbed, with a special focus on the usage of the PlanetLab/Linux Containers-based software that is used to run NorNet Core. Gran, Ernst Gunnar; Dreibholz, Thomas and Kvalbein, Amund: ``NorNet Core – A Multi-Homed Research Testbed´´ (PDF, 1458 KiB, ), in Computer Networks, Special Issue on Future Internet Testbeds, vol. 61, pp. 75–87, DOI 10.1016/j.bjp.2013.12.035, ISSN 1389-1286, March 14, 2014, [BibTeX, XML]. Abstract: Over the last decade, the Internet has grown at a tremendous speed in both size and complexity. Nowadays, a large number of important services – for instance e-commerce, healthcare and many others – depend on the availability of the underlying network. Clearly, service interruptions due to network problems may have a severe impact. On the long way towards the Future Internet, the complexity will grow even further. Therefore, new ideas and concepts must be evaluated thoroughly, and particularly in realistic, real-world Internet scenarios, before they can be deployed for production networks. For this purpose, various testbeds – for instance PlanetLab, GpENI or G-Lab – have been established and are intensively used for research. However, all of these testbeds lack the support for so-called multi-homing. Multi-homing denotes the connection of a site to multiple Internet service providers, in order to achieve redundancy. Clearly, with the need for network availability, there is a steadily growing demand for multi-homing. The idea of the NorNet Core project is to establish a Future Internet research testbed with multi-homed sites, in order to allow researchers to perform experiments with multi-homed systems. Particular use cases for this testbed include realistic experiments in the areas of multi-path routing, load balancing, multi-path transport protocols, overlay networks and network resilience. In this paper, we introduce the NorNet Core testbed as well as its architecture. Dreibholz, Thomas: ``The Status of MPTCP Deployment and Evaluation in the NorNet Testbed´´ (PDF, 1514 KiB, ), in Proceedings of the 89th IETF Meeting, London/United Kingdom, March 3, 2014, [BibTeX, XML]. Dreibholz, Thomas: ``The NorNet Core Testbed – An Experiment Tutorial´´ (PDF, 4454 KiB, ), in Proceedings of the 1st International NorNet Users Workshop (NNUW-1), Fornebu, Akershus/Norway, September 19, 2013, [BibTeX, XML]. Dreibholz, Thomas: ``The NorNet Core Testbed – Introduction and Status´´ (PDF, 8399 KiB, ), in Proceedings of the 1st International NorNet Users Workshop (NNUW-1), Fornebu, Akershus/Norway, September 18, 2013, [BibTeX, XML]. Dreibholz, Thomas: ``The NorNet Testbed: A Platform for Evaluating Multi-Path Transport in the Real-World Internet´´ (PDF, 13341 KiB, ), in Proceedings of the 87th IETF Meeting, Berlin/Germany, July 30, 2013, [BibTeX, XML]. Dreibholz, Thomas and Ferlin, Simone: ``The NorNet Research Testbed´´ (PDF, 12015 KiB, ), Talk, in Proceedings of the CHANGE Bootcamp Workshop, Louvain-la-Neuve/Belgium, July 17, 2013, [BibTeX, XML]. Becke, Martin; Dreibholz, Thomas; Bayer, Andreas; Packeiser, Markus and Rathgeb, Erwin Paul: ``Alternative Transmission Strategies for Multipath Transport of Multimedia Streams over Wireless Networks´´ (PDF, 792 KiB, ), in Proceedings of the 12th IEEE International Conference on Telecommunications (ConTEL), pp. 147–153, ISBN 978-953-184-175-7, Zagreb, Središnja Hrvatska/Croatia, June 26, 2013, [BibTeX, XML]. Abstract: With the strongly growing popularity of mobile devices like smartphones and tablet computers, the number of end-systems with more than one network access – like UMTS/LTE and WLAN – is also increasing. This so-called multi-homing also leads to the desire of utilising multiple network paths simultaneously, in order to improve application payload throughput. Clearly, this so-called multi-path transfer feature is also very useful for the transport of multimedia contents, particularly when a single network access alone is not fast enough to fulfil the bandwidth requirements of the application. In many cases, multimedia transport is also sensitive for delays and packet losses. However, the focus of the current multi-path transfer approaches has been on bandwidth only. In order to tackle this challenge, our paper introduces two new send strategies to map payload data to different wireless paths. Finally, by using measurements, we show that a significant performance improvement for delay and loss-sensitive applications can be achieved in comparison to the existing approaches. Dreibholz, Thomas and Gran, Ernst Gunnar: ``Design and Implementation of the NorNet Core Research Testbed for Multi-Homed Systems´´ (PDF, 20082 KiB, ), in Proceedings of the 3nd International Workshop on Protocols and Applications with Multi-Homing Support (PAMS), pp. 1094–1100, DOI 10.1109/WAINA.2013.71, ISBN 978-0-7695-4952-1, Barcelona, Catalonia/Spain, March 27, 2013, [BibTeX, XML]. Abstract: The Internet has made it possible to communicate and to use services over large geographical distances. While it has originally been built for less critical services like e-mail and file transfer, it is nowadays also increasingly often used for availability-critical services like e.g. e-commerce or healthcare. Clearly, the reachability of such services must be ensured by so-called multi-homing of endpoints. That is, endpoints are simultaneously connected to multiple Internet Service Providers (ISP) to provide redundancy. If one ISP has problems, it is intended that the connection to another one still works. However, such assumptions have never been verified in real, large-scale setups. The intention of the NorNet project is to build up a realistic Internet testbed for multi-homing. In this paper, we describe the design of NorNet with focus on the implementation of its fixed-line part: NorNet Core. This paper is intended to give researchers an overview of its mode of operation, its capabilities as well as its interesting feature realisations. The knowledge about these items is very useful to plan own experiments in the NorNet testbed. Becke, Martin; Dreibholz, Thomas; Adhari, Hakim and Rathgeb, Erwin Paul: ``On the Fairness of Transport Protocols in a Multi-Path Environment´´ (PDF, 1970 KiB, ), in Proceedings of the IEEE International Conference on Communications (ICC), pp. 2666–2672, DOI 10.1109/ICC.2012.6363695, ISBN 978-1-4577-2052-9, Ottawa, Ontario/Canada, June 12, 2012, [BibTeX, XML]. Abstract: Today, a steadily growing number of devices contains multiple network interfaces. For example, nearly all smartphones are equipped with at least W-LAN as well as 3G/4G interfaces. In consequence, there is a rising demand for so-called multi-path transfer, which utilizes all of these interfaces simultaneously in order to maximize the payload throughput of applications. Currently, this so-called multi-path transfer is very actively discussed by the IETF, in form of the Multi-Path TCP (MPTCP) extension for TCP as well as the Concurrent Multi-path Transfer extension for SCTP (CMT-SCTP). Their larger-scale deployment in the Internet is expected for the near future. A key issue that prevents the standardization of these approaches is the fairness to concurrent TCP flows. A multi-path transfer should behave "TCP-friendly", i.e. cause no harm to the performance of the very widely deployed TCP-based applications. In this paper, we first extend the notion of "fairness" from single-path transport to multi-path transport. Furthermore, we introduce the relevant congestion control approaches in the IETF context for single-path as well as multi-path transfer. We simulatively analyze these approaches in a couple of interesting network configuration scenarios, in order to show their behavior with special regard to the fairness definitions. Particularly, we also point out items of further discussion which are the result of the current approaches. Becke, Martin; Dreibholz, Thomas; Adhari, Hakim and Rathgeb, Erwin Paul: ``A Future Internet Architecture supporting Multipath Communication Networks´´ (PDF, 743 KiB, ), in Proceedings of the 13th IEEE/IFIP Network Operations and Management Symposium (NOMS), pp. 639–642, DOI 10.1109/NOMS.2012.6211975, ISBN 978-1-4673-0268-5, Maui, Hawaii/U.S.A., April 19, 2012, [BibTeX, XML]. Abstract: The classic layered OSI reference model has reached its limits for the Internet of today. In this paper, we propose a clean-slate conceptual design of a new architecture as a contribution to the ongoing discussion on the Future Internet. We address the shortcomings of the layered model by redesigning the classical model. Our approach differs from the concepts found in prior work, which focus on special parts of the problems (such as the application, the service or the event) by staggering back a couple of steps and trying to see the requirements from a different perspective. Our concept – which is denoted as Encapsulated Responsibility-Centric Architecture Model (ERiCA) – focuses on determining the responsibilities by using different planes in addition to a partitioning of the network into different decision domains. With this partitioning, we can reduce the complexity of providing a certain service. Dreibholz, Thomas; Adhari, Hakim; Becke, Martin and Rathgeb, Erwin Paul: ``Simulation and Experimental Evaluation of Multipath Congestion Control Strategies´´ (PDF, 403 KiB, ), in Proceedings of the 2nd International Workshop on Protocols and Applications with Multi-Homing Support (PAMS), DOI 10.1109/WAINA.2012.186, ISBN 978-0-7695-4652-0, Fukuoka/Japan, March 29, 2012, [BibTeX, XML]. Abstract: The need for service resilience is leading to a steadily growing number of multi-homed Internet sites. In consequence, this results in a growing demand for utilising multiple Internet accesses simultaneously, in order to improve application payload throughput during normal operation. Multi-path Transport Layer protocol extensions – like Multi-Path TCP (MPTCP) for TCP and Concurrent Multipath Transfer for SCTP (CMT-SCTP) – allow applications to make use of such network topologies. However, since TCP – which constitutes the basis of most Internet applications – and its congestion control procedures have been designed under the assumption of single-homed sites, fairness issues may arise by the usage of multipath transport. These issues are addressed by advanced congestion control approaches, which have already been examined by simulations. However, real-life network measurements are missing. In this paper, we perform an experimental proof-of-concept evaluation of several multipath congestion control strategies, which are currently under discussion within the IETF in the context of MPTCP as well as CMT-SCTP. Particularly, we validate effects that have been observed in simulations, in order to trigger further discussions on multipath congestion control. Also, our goal is to provide insight into the different approaches to support the ongoing IETF standardisation activities on multipath transport protocols. Adhari, Hakim; Becke, Martin and Dreibholz, Thomas: ``On the Fairness of Transport Protocols in a Multi-Path Environment´´ (PDF, 1004 KiB, ), in Proceedings of the 83rd IETF Meeting, Paris/France, March 27, 2012, [BibTeX, XML]. Dreibholz, Thomas: ``Evaluation and Optimisation of Multi-Path Transport using the Stream Control Transmission Protocol´´ (PDF, 36779 KiB, ), Habilitation Treatise, University of Duisburg-Essen, Faculty of Economics, Institute for Computer Science and Business Information Systems, URN urn:nbn:de:hbz:464-20120315-103208-1, March 13, 2012, [BibTeX, XML]. Abstract: The Stream Control Transmission Protocol (SCTP) as defined in RFC 4960 is an advanced Transport Layer protocol that provides support for multi-homing. That is, SCTP endpoints may simultaneously use multiple Network Layer addresses, which allows to connect the endpoints to multiple networks for redundancy purposes. However, for the transfer of user data, only one of the possible paths is currently used at a time. All other paths remain as backup and are only used for retransmissions. Clearly, the existence of multiple paths has led to the idea of applying load sharing among the paths. An extension to SCTP – denoted as Concurrent Multipath Transfer (CMT) – realises this load sharing functionality. While this approach works well for similar paths, i.e. paths having similar characteristics regarding bandwidths, bit error rates and delays, the use of dissimilar paths does not work that neatly. In this thesis, the issues of dissimilar paths for CMT-based load sharing will be demonstrated first. The reasons for these issues will be identified and solutions proposed. These solutions will be evaluated in simulations, as well as partially also in a real-world Internet testbed setup, in order to show their effectiveness. In particular, it will be shown that a combination of multiple mechanisms is necessary to make CMT work as expected under a wide range of network and system parameters. Furthermore, the fairness of CMT-based transport – in concurrency to classic non-CMT flows – will be analysed. The usage of plain CMT leads to an overly aggressive bandwidth occupation on so-called shared bottlenecks. As a countermeasure, the idea of Resource Pooling will be utilised. For this purpose, two new and one adapted congestion control approach – all based on the Resource Pooling principle – will be introduced and examined in similar as well as dissimilar path setups, in order to show how to fairly deploy CMT transport in the Internet. The results of this work have also been contributed to the ongoing IETF standardisation process of SCTP and its extensions. Dreibholz, Thomas: ``Konzepte für das Future Internet aus der Netzperspektive´´ (PDF, 5777 KiB, ), Habilitation Talk, University of Duisburg-Essen, Faculty of Economics, Institute for Computer Science and Business Information Systems, URN urn:nbn:de:hbz:464-20120404-135350-0, March 13, 2012, [BibTeX, XML]. Abstract: Vielen seiner Benutzer erscheint das Internet als neuartig und hochmodern. Seine Grundlagen jedoch sind keineswegs neu, sondern basieren auf mittlerweile fast 40 Jahre alten Ideen. Dienste werden mittels eines geschichteten, hierarchischen Protokollstacks realisiert, bei welchem eine Interaktion nicht-benachbarter Schichten nicht vorgesehen ist. Dieser starre Aufbau macht bereits das Anpassen der Internet-Architektur an die Anforderungen der heutigen Anwendungen – wie etwa File Sharing, Videotelefonie und mobile Endgeräte – kompliziert. Die großen Herausforderungen des zukünftigen Internets – welches als das Future Internet bezeichnet wird – mit Anwendungsszenarien wie Cloud Computing, Internet of Things, Sensornetzwerken und vielen weiteren – erfordern jedoch noch weitaus umfangreichere Anpassungen. Zudem ist eine große Flexibilität erforderlich, um auch weiteren – heute noch nicht absehbaren – Anforderungen gerecht zu werden. Im Rahmen dieses Habilitationsvortrages wird zunächst kurz auf die Probleme des aktuellen Internets eingegangen sowie die Herausforderungen des Future Internets vorgestellt. Im Anschluss daran wird eine Auswahl der für den Übergang zum Future Internet möglichen evolutionären sowie revolutionären Ansätze vorgestellt. Der Schwerpunkt liegt hierbei auf den noch relativ neuen – und in der Forschung momentan sehr aktiv diskutierten – revolutionären Ansätzen, welche mit der Idee des sogenannten Clean Slate einen vollständigen Neuansatz anstreben. Hierbei werden die Ansätze der Funktionalen Komposition, des Content-Centric Networking sowie der Virtualisierung von Netzwerken vorgestellt. Zum Schluss wird dann auf die Frage eingegangen, wie eine Nutzung der vorgestellten Ansätze in der Praxis möglich ist und welche der aktuell in Diskussion befindlichen Ansätze sich in Zukunft voraussichtlich durchsetzen werden. Dreibholz, Thomas; Adhari, Hakim; Becke, Martin and Rathgeb, Erwin Paul: ``NetPerfMeter – A Versatile Tool for Multi-Protocol Network Performance Evaluations´´ (PDF, 334 KiB, ), OMNeT++ Code Contribution, University of Duisburg-Essen, Institute for Experimental Mathematics, February 8, 2012, [BibTeX, XML]. Abstract: Transport Layer protocols supporting multipath transfer, i.e. to simultaneously utilise multiple Network Layer paths, are actively discussed in the IETF – particularly in the context of Multi-Path TCP (MPTCP) and Concurrent Multipath Transfer for SCTP (CMT-SCTP). Congestion control for such protocols is an important research topic. In this code contribution paper, we introduce our application model NetPerfMeter. NetPerfMeter has been developed for performance evaluations of different transport protocols, like for the Linux/FreeBSD performance metering application NetPerfMeter. Dreibholz, Thomas; Becke, Martin; Adhari, Hakim and Rathgeb, Erwin Paul: ``Evaluation of A New Multipath Congestion Control Scheme using the NetPerfMeter Tool-Chain´´ (PDF, 360 KiB, ), in Proceedings of the 19th IEEE International Conference on Software, Telecommunications and Computer Networks (SoftCOM), pp. 1–6, ISBN 978-953-290-027-9, Hvar, Dalmacija/Croatia, September 16, 2011, [BibTeX, XML]. Abstract: Multi-homed Internet sites become more and more widespread, due to the rising dispersal of inexpensive Internet access technologies combined with the growing deployment of resilience-critical applications. Concurrent Multipath Transfer (CMT) denotes the Transport Layer approach to utilise multiple network paths simultaneously, in order to improve application payload throughput. Currently, CMT is a quite hot topic in the IETF – in form of the Multipath TCP (MPTCP) and CMT-SCTP protocol extensions for TCP and SCTP. However, an important issue is still not fully solved: multipath congestion control. In order to support the IETF activities, we have set up a distributed Internet testbed for CMT evaluation. An important tool – which we have developed for multi-protocol Transport Layer performance analysis – is the Open Source NetPerfMeter tool-chain. It supports the parametrisation and processing of measurement runs as well as results collection, post-processing and plotting. However, its key feature is to support multiple Transport Layer protocols, which makes a quantitative comparison of different protocols – including state-of-the-art features like CMT – possible. In this paper, we first introduce NetPerfMeter and then show a proof-of-concept performance evaluation of CMT congestion controls which are currently discussed in the IETF standardisation process of CMT-SCTP. Dreibholz, Thomas; Becke, Martin; Adhari, Hakim and Rathgeb, Erwin Paul: ``On the Impact of Congestion Control for Concurrent Multipath Transfer on the Transport Layer´´ (PDF, 6498 KiB, ), in Proceedings of the 11th IEEE International Conference on Telecommunications (ConTEL), pp. 397–404, ISBN 978-953-184-152-8, Graz, Steiermark/Austria, June 16, 2011, [BibTeX, XML]. Abstract: Due to the resilience requirements of a steadily growing number of critical Internet services (like emergency call handling or e-commerce transactions), the deployment of multi-homed network sites becomes more and more common. Having multiple Internet access paths, it seems straightforward to utilise them simultaneously in order to improve payload throughput by so-called Concurrent Multipath Transfer (CMT). Currently, CMT extensions for the two important Internet Transport Layer protocols – Multipath-TCP (MPTCP) for TCP and CMT-SCTP for SCTP – are in the focus of IETF standardisation. A challenge – which is currently very actively discussed in the IETF context – is congestion control for these CMT protocols. Based on the idea of Resource Pooling (RP), two approaches are currently discussed in the IETF: our own approach CMT/RP for CMT-SCTP as well as the MPTCP congestion control for MPTCP. Both approaches only have been roughly tested yet – mostly in similar path setups, i.e. paths having almost the same QoS characteristics, using "their" protocol. Therefore, the goal of this paper is to compare the existing approaches. Particularly, we also analyse more challenging scenarios containing dissimilar paths, i.e. paths having differing characteristics. Our goal is to provide insight into the different approaches, to support the IETF standardisation activities on CMT. Adhari, Hakim; Dreibholz, Thomas; Becke, Martin; Rathgeb, Erwin Paul and Tüxen, Michael: ``Evaluation of Concurrent Multipath Transfer over Dissimilar Paths´´ (PDF, 666 KiB, ), in Proceedings of the 1st International Workshop on Protocols and Applications with Multi-Homing Support (PAMS), pp. 708–714, DOI 10.1109/WAINA.2011.92, ISBN 978-0-7695-4338-3, Singapore, March 22, 2011, [BibTeX, XML]. Abstract: The steadily growing deployment of resilience-critical Internet services is leading to an increasing number of Multi-Homed network sites. Asymmetric Digital Subscriber Lines (ADSL) are an inexpensive way to add a secondary Internet access connection. With the development of Multi-Path Transport Layer protocols – like Multipath TCP (MPTCP) and the Stream Control Transmission Protocol (SCTP) furnished by a Concurrent Multipath Transfer (CMT-SCTP) extension – there is also a strong interest in utilising all access connections simultaneously to improve the data throughput of the applications. However, combining network paths over ADSL with paths over other access technologies like fibre optic links implies highly dissimilar paths with significantly different bandwidths, delays and queuing behaviours. Efficient Multi-Path transport over such dissimilar paths is a challenging task for the new Transport Layer protocols under development. In this paper, we show the difficulties of Multi-Path transport in a real-world dissimilar path setup which consists of a high-speed fibre optic link and an ADSL connection. After that, we present an optimised buffer handling technique which solves the transport efficiency issues in this setup. Our optimisation is first analysed by simulations. Finally, we also show the usefulness of our approach by experimental evaluation in a real Multi-Homed Internet setup. Becke, Martin; Dreibholz, Thomas; Rathgeb, Erwin Paul and Formann, Johannes: ``Link Emulation on the Data Link Layer in a Linux-based Future Internet Testbed Environment´´ (PDF, 465 KiB, ), in Proceedings of the 10th International Conference on Networks (ICN), pp. 92–98, ISBN 978-1-61208-002-4, St. Maarten/Netherlands Antilles, January 25, 2011, [BibTeX, XML]. Abstract: Protocol design and development is not a straight-forward process. Each approach must be validated for interactions and side-effects in the existing network environments. But the Internet itself is not a good test environment, since its components are not controllable and certain problem situations (like congestion or error conditions) are difficult to reproduce. Various testbeds have been built up to fill this gap. Most of these testbeds also support link emulation, i.e. using software to mimic the characteristic behaviour of certain kinds of network links (like bandwidth bottlenecks or error-prone radio transmissions). The most popular link emulation systems are the Linux-based NetEm and Dummynet, which are e.g. applied on the IP layer of Planet-Lab and various other testbeds. However, the restriction to the OSI Network Layer (here: IP) is insufficient to test new non-IP Future Internet protocols. In this paper, we first introduce Dummynet and NetEm. After that, we will present our approach of adapting Dummynet for Linux to support link emulation on the Data Link Layer. Finally, we evaluate the applicability and performance of Dummynet and NetEm for link emulation on the Data Link Layer, in a Planet-Lab-based testbed environment. Our goal is to outline the performance and limitations of both approaches in the context of Planet-Lab-based testbeds, in order to make them applicable for the evaluation of non-IP Future Internet protocols. Dreibholz, Thomas; Becke, Martin; Rathgeb, Erwin Paul and Tüxen, Michael: ``On the Use of Concurrent Multipath Transfer over Asymmetric Paths´´ (PDF, 1036 KiB, ), in Proceedings of the IEEE Global Communications Conference (GLOBECOM), DOI 10.1109/GLOCOM.2010.5683579, ISBN 978-1-4244-5637-6, Miami, Florida/U.S.A., December 7, 2010, [BibTeX, XML]. Abstract: With the deployment of more and more resilience-critical Internet applications, there is a rising demand for multi-homed network sites. This leads to the desire for simultaneously utilising all available access paths to improve application data throughput. This is commonly known as Concurrent Multipath Transfer (CMT), approaches for several Transport Layer protocols have been proposed. Combined with Resource Pooling (RP), CMT can also fairly coexist with concurrent non-CMT flows. Current approaches focus on symmetric paths (i.e. similar bandwidth, delay and error rate). However, asymmetric paths are much more likely – particularly for realistic Internet setups – and efficient CMT usage on such paths is therefore crucial. In this paper, we first show the challenges of plain as well as RP-aware CMT data transport over asymmetric paths. After that, we introduce mechanisms for efficient transport over such paths. Finally, we analyse the performance of our approaches by using simulations. Dreibholz, Thomas; Seggelmann, Robin; Tüxen, Michael and Rathgeb, Erwin Paul: ``Transmission Scheduling Optimizations for Concurrent Multipath Transfer´´ (PDF, 633 KiB, ), in Proceedings of the 8th International Workshop on Protocols for Future, Large-Scale and Diverse Network Transports (PFLDNeT), vol. 8, ISSN 2074-5168, Lancaster, Pennsylvania/U.S.A., November 29, 2010, [BibTeX, XML]. Abstract: SCTP is a general-purpose Transport Layer protocol with out-of-the-box support for multi-streaming as well as multi-homing. A protocol extension, which is denoted as CMT-SCTP, extends SCTP by supporting Concurrent Multipath Transfer (CMT). That is, multiple network paths are utilized simultaneously in order to improve the payload data throughput. However, dissimilar paths – i.e. paths having different delays or bandwidths – are challenging and also very likely in internet setups. In this paper, we show how CMT-SCTP data transport performance can be improved by combining multi-streaming with an advanced stream scheduling policy and SCTP API enhancements. The performance benefit of our approach in dissimilar path setups is proven by simulations. Dreibholz, Thomas; Becke, Martin; Henke, Christian and Rathgeb, Erwin Paul: ``An Approach for Transferring an End-to-End Transport Service into a Functional Building Block Structure´´ (PDF, 149 KiB, ), in Proceedings of the 5th GI/ITG KuVS Workshop on the Future Internet, Stuttgart, Baden-Württemberg/Germany, June 9, 2010, [BibTeX, XML]. Abstract: Current network stacks based on the classic OSI layered reference model are restricted and inflexible, which makes the addition and deployment of new features difficult. Operating systems offer an interface for the Transport Layer functionalities to applications. The usage of this interface is very widespread, making it useful to maintain this interface. However, the layered structure should be replaced. In this paper, we propose our approach for breaking up the functionalities of the OSI Transport Layer into the concept so called functional building blocks. Each functional building block provides a particular service, which – in interaction with the other functional building blocks – is able to provide a service similar to the classic OSI Transport Layer. The concept allows for easy removal, replacement or addition of existing and new functional building blocks to adapt the service to state-of-the-art and future requirements, particularly including multi-path transport and QoS. Dreibholz, Thomas; Becke, Martin; Pulinthanath, Jobin and Rathgeb, Erwin Paul: ``Applying TCP-Friendly Congestion Control to Concurrent Multipath Transfer´´ (PDF, 957 KiB, ), in Proceedings of the 24th IEEE International Conference on Advanced Information Networking and Applications (AINA), pp. 312–319, DOI 10.1109/AINA.2010.117, ISBN 978-0-7695-4018-4, Perth, Western Australia/Australia, April 21, 2010, [BibTeX, XML]. Abstract: The steadily growing importance of Internet-based applications and their resilience requirements lead to a rising number of multi-homed sites. The idea of Concurrent Multipath Transfer (CMT) is to exploit the existence of multiple paths among endpoints to increase application data throughput. However, handling the congestion control of each path independently lacks of fairness against non-CMT flows. In this paper, we describe our approach of combining CMT with the idea of Resource Pooling (RP) in order to achieve a performance improvement over non-CMT transfer while still remaining fair to concurrent flows on congested links. Unlike existing approaches which adapt classic TCP to a multi-homed CMT protocol, our approach does not depend on specific characteristics of TCP. Instead, we base on already entrenched functional blocks of CMT transfer, on the example of the CMT-enabled SCTP (Stream Control Transmission Protocol). In a simulative proof-of-concept analysis, we show that our approach – while relatively simple – is already quite effective. Ford, Alan; Raiciu, Costin; Handley, Mark; Bonaventure, Olivier and Paasch, Christoph: ``TCP Extensions for Multipath Operation with Multiple Addresses´´ (TXT, 207 KiB, ), Internet Draft draft-ietf-mptcp-rfc6824bis-13, IETF, February 17, 2019, [BibTeX, XML]. Abstract: TCP/IP communication is currently restricted to a single path per connection, yet multiple paths often exist between peers. The simultaneous use of these multiple paths for a TCP/IP session would improve resource usage within the network and, thus, improve user experience through higher throughput and improved resilience to network failure. Multipath TCP provides the ability to simultaneously use multiple paths between peers. This document presents a set of extensions to traditional TCP to support multipath operation. The protocol offers the same type of service to applications as TCP (i.e., reliable bytestream), and it provides the components necessary to establish and use multiple TCP flows across potentially disjoint paths. This document specifies v1 of Multipath TCP, obsoleting v0 as specified in RFC6824, through clarifications and modifications primarily driven by deployment experience. Song, Fei; Zhang, Hongke; Chan, Anthony and Wei, Anni: ``One Way Latency Considerations for MPTCP´´ (TXT, 21 KiB, ), Internet Draft draft-song-mptcp-owl-05, IETF, Individual Submission, December 16, 2018, [BibTeX, XML]. Previous versions: draft-song-mptcp-owl-04, 03, 02, 01, 00. Abstract: This document discusses the use of One Way Latency (OWL) for enhancing multipath TCP (MPTCP). Several use cases of OWL, such as retransmission policy and crucial data scheduling are analyzed. Two kinds of OWL measurement approaches are also provided and compared. More explorations related with OWL will be helpful to the performance of MPTCP. Barré, Sébastien; Detal, Gregory; Bonaventure, Olivier and Paasch, Christoph: ``TFO support for Multipath TCP´´ (TXT, 29 KiB, ), Internet Draft draft-barre-mptcp-tfo-04, IETF, Individual Submission, November 22, 2018, [BibTeX, XML]. Previous versions: draft-barre-mptcp-tfo-03, 02, 01, 00. Abstract: TCP Fast Open (TFO) is a TCP extension that allows sending data in the SYN, instead of waiting until the TCP connection is established. This document describes what parts of Multipath TCP must be adapted to support it, and how TFO and MPTCP can operate together. Hesmans, Benjamin; Bonaventure, Olivier and Duchêne, Fabien: ``A socket API to control Multipath TCP´´ (TXT, 33 KiB, ), Internet Draft draft-hesmans-mptcp-socket-03, IETF, Individual Submission, March 5, 2018, [BibTeX, XML]. Previous versions: draft-hesmans-mptcp-socket-02, 01, 00. Abstract: This document proposes an enhanced socket API to allow applications to control the operation of a Multipath TCP stack. Boucadair, Mohamed; Jacquenet, Christian and Reddy, Tirumaleswar: ``DHCP Options for Network-Assisted Multipath TCP (MPTCP)´´ (TXT, 28 KiB, ), Internet Draft draft-boucadair-mptcp-dhc-08, IETF, Individual Submission, October 8, 2017, [BibTeX, XML]. Previous versions: draft-boucadair-mptcp-dhc-07, 06, 05, 04, 03, 02, 01, 00. Abstract: Because of the lack of Multipath TCP (MPTCP) support at the server side, some service providers now consider a network-assisted model that relies upon the activation of a dedicated function called MPTCP Conversion Point (MCP). Network-assisted MPTCP deployment models are designed to facilitate the adoption of MPTCP for the establishment of multi-path communications without making any assumption about the support of MPTCP by the communicating peers. MCPs located in the network are responsible for establishing multi-path communications on behalf of endpoints, thereby taking advantage of MPTCP capabilities to achieve different goals that include (but are not limited to) optimization of resource usage (e.g., bandwidth aggregation), of resiliency (e.g., primary/backup communication paths), and traffic offload management. This document focuses on the explicit deployment scheme where the identity of the MPTCP Conversion Point(s) is explicitly configured on connected hosts. This document specifies DHCP (IPv4 and IPv6) options to configure hosts with Multipath TCP (MPTCP) parameters. Boucadair, Mohamed and Jacquenet, Christian: ``RADIUS Extensions for Network-Assisted Multipath TCP (MPTCP)´´ (TXT, 23 KiB, ), Internet Draft draft-boucadair-mptcp-radius-05, IETF, Individual Submission, October 8, 2017, [BibTeX, XML]. Previous versions: draft-boucadair-mptcp-radius-04, 03, 02, 01, 00. Abstract: Because of the lack of Multipath TCP (MPTCP) support at the server side, some service providers now consider a network-assisted model that relies upon the activation of a dedicated function called MPTCP Conversion Point (MCP). Network-assisted MPTCP deployment models are designed to facilitate the adoption of MPTCP for the establishment of multi-path communications without making any assumption about the support of MPTCP by the communicating peers. MCPs located in the network are responsible for establishing multi-path communications on behalf of endpoints, thereby taking advantage of MPTCP capabilities to achieve different goals that include (but are not limited to) optimization of resource usage (e.g., bandwidth aggregation), of resiliency (e.g., primary/backup communication paths), and traffic offload management. This document specifies a new Remote Authentication Dial-In User Service (RADIUS) attributes that carry the IP addresses that will be returned to authorized users to reach one or multiple MCPs. Xu, Changqiao; Qin, Jiuren; Zhang, Hongke; Xiong, Chunshan and Zhu, Lei: ``A Message-Oriented Extension to Multipath Transmission Control Protocol (MPTCP)´´ (TXT, 24 KiB, ), Internet Draft draft-xu-mptcp-momp-04, IETF, Individual Submission, June 21, 2017, [BibTeX, XML]. Previous versions: draft-xu-mptcp-momp-03, 02, 01, 00. Abstract: This memo specifies a message-oriented extension for Multipath TCP (MPTCP) which aims to serve high-bandwidth and real-time applications. By introducing a message mapping to MPTCP, Message- Oriented MPTCP (MO-MPTCP) attaches some message features like boundaries, priority and dependency to bytestream. With such message-oriented information, MPTCP senders can avoid the waste of transmission resources and improve the transmission efficiency. Xu, Changqiao; Huang, Hui; Zhang, Hongke; Xiong, Chunshan and Zhu, Lei: ``Multipath Transmission Control Protocol (MPTCP) Partial Reliability Extension´´ (TXT, 24 KiB, ), Internet Draft draft-xu-mptcp-prmp-04, IETF, Individual Submission, June 20, 2017, [BibTeX, XML]. Previous versions: draft-xu-mptcp-prmp-03, 02, 01, 00. Abstract: This memo presents an extension to the Multipath Transmission Control Protocol (MPTCP) that allows MPTCP endpoints in which case both sender side and receiver side support this function to provide partially reliable data transmission service to the upper layer applications. In order to achieve the above goal, this memo extents MPTCP by adding two new subtypes which are expressed as "PR_CAPABLE" and "ACK_NOTIFY" and the corresponding processes are also introduced. The extension can provide the backward-compatibility with MPTCP if the new features are not available. Previous versions: draft-dreibholz-mptcp-nornet-experience-03, 02, 01, 00. Xu, Mingwei; Cao, Yu and Dong, Enhuan: ``Delay-based Congestion Control for MPTCP´´ (TXT, 20 KiB, ), Internet Draft draft-xu-mptcp-congestion-control-05, IETF, Individual Submission, January 1, 2017, [BibTeX, XML]. Previous versions: draft-xu-mptcp-congestion-control-04, 03, 02, 01, 00. Abstract: This document describes the mechanism of wVegas (weighted Vegas), which is a delay-based congestion control for MPTCP. The current congestion control algorithm of MPTCP, LIA, achieves only course- grained load balancing, since it is based on packet loss event. On the contrary, wVegas adopts packet queuing delay as congestion signals, thus achieving fine-grained load balancing. Compared with loss-based algorithms, wVegas is more sensitive to the changes of network congestion and thus achieves more timely traffic shifting and quicker convergence. WVegas has been implemented in the Linux Kernel and is part of the UCLouvain&apos;s MPTCP implementation now. Boucadair, Mohamed and Jacquenet, Christian: ``Negotiating the Maximum Number of Multipath TCP (MPTCP) Subflows´´ (TXT, 11 KiB, ), Internet Draft draft-boucadair-mptcp-max-subflow-03, IETF, Individual Submission, November 24, 2016, [BibTeX, XML]. Previous versions: draft-boucadair-mptcp-max-subflow-02, 01, 00. Abstract: This document specifies an experimental Multipath TCP (MPTCP) option that is meant to negotiate the maximum number of subflows that can be established and maintained for a given MPTCP connection. The purpose is to minimize any possible performance degradation that can be induced by a possibly large number of establishment requests for additional subflows if the remote endpoint is not appropriately dimensioned to handle such requests. Bonaventure, Olivier; Paasch, Christoph and Detal, Gregory: ``Use Cases and Operational Experience with Multipath TCP´´ (TXT, 77 KiB, ), Internet Draft draft-ietf-mptcp-experience-07, IETF, October 27, 2016, [BibTeX, XML]. Abstract: This document discusses both use cases and operational experience with Multipath TCP in real networks. It lists several prominent use cases where Multipath TCP has been considered and is being used. It also gives insight to some heuristics and decisions that have helped to realize these use cases and suggests possible improvements. Olteanu, Vladimir and Raiciu, Costin: ``Layer 4 Loadbalancing for MPTCP´´ (TXT, 16 KiB, ), Internet Draft draft-olteanu-mptcp-loadbalance-00, IETF, Individual Submission, July 8, 2016, [BibTeX, XML]. Abstract: Layer 4 loadbalancers are widely used in the deployment of large- scale web services. A large number of servers accept incoming connections from clients, while multiple loadbalancers make sure that traffic is spread evenly across the servers. Due to its use of multiple subflows, Multipath TCP poses several issues to the design of a scalable layer 4 loadbalancer that supports it. This document presents two ways in which MPTCP connections can be loadbalanced across a large pool of servers. Both approaches entail using a slightly modified server stack and work well with unmodified MPTCP clients. Duchêne, Fabien and Bonaventure, Olivier: ``Multipath TCP Address Advertisement´´ (TXT, 30 KiB, ), Internet Draft draft-duchene-mptcp-add-addr-00, IETF, Individual Submission, July 8, 2016, [BibTeX, XML]. Abstract: Multipath TCP [RFC6824] defines the ADD_ADDR option that allows a host to announce its addresses to the remote host. In this document we propose some improvements to this mechanism. Peirens, Bart; Detal, Gregory; Barré, Sébastien and Bonaventure, Olivier: ``Link bonding with transparent Multipath TCP´´ (TXT, 37 KiB, ), Internet Draft draft-peirens-mptcp-transparent-00, IETF, Individual Submission, July 5, 2016, [BibTeX, XML]. Abstract: This document describes the utilisation of the transparent Multipath TCP mode to enable network operators to provide link bonding services in hybrid access networks. Boucadair, Mohamed; Jacquenet, Christian; Behaghel, Denis; Secci, Stefano; Henderickx, Wim; Skog, Robert; Bonaventure, Olivier; Vinapamula, Suresh; Seo, SungHoon; Cloetens, Wouter; Meyer, Ullrich and Contreras, Luis M.: ``An MPTCP Option for Network-Assisted MPTCP Deployments: Plain Transport Mode´´ (TXT, 77 KiB, ), Internet Draft draft-boucadair-mptcp-plain-mode-08, IETF, Individual Submission, July 4, 2016, [BibTeX, XML]. Previous versions: draft-boucadair-mptcp-plain-mode-07, 06, 05, 04, 03, 02, 01, 00. Abstract: Because of the lack of Multipath TCP (MPTCP) support at the server side, some service providers now consider a network-assisted model that relies upon the activation of a dedicated function called MPTCP concentrator. This document focuses on a deployment scheme where the identity of the MPTCP concentrator(s) is explicitly configured on connected hosts. This document specifies an MPTCP option that is used to avoid the encapsulation of packets and out-of-band signaling between the CPE and the MPTCP concentrator. Also, this document specifies how UDP traffic, in particular, can be distributed among available paths by leveraging MPTCP capabilities. Barik, Runa; Ferlin, Simone and Welzl, Michael: ``A Linked Slow-Start Algorithm for MPTCP´´ (TXT, 15 KiB, ), Internet Draft draft-barik-mptcp-lisa-01, IETF, Individual Submission, June 27, 2016, [BibTeX, XML]. Abstract: This document describes the LISA (Linked Slow-Start Algorithm) for Multipath TCP (MPTCP). Currently during slow-start, subflows behave like independent TCP flows making MPTCP unfair to cross-traffic and causing more congestion at the bottleneck. This also yields more losses among the MPTCP subflows. LISA couples the initial windows (IW) of MPTCP subflows during the initial slow-start phase to remove this adverse behavior. Paasch, Christoph and Ford, Alan: ``Application Layer Authentication for MPTCP´´ (TXT, 18 KiB, ), Internet Draft draft-paasch-mptcp-application-authentication-00, IETF, Individual Submission, May 27, 2016, [BibTeX, XML]. Abstract: Multipath TCP (MPTCP), described in , is an extension to TCP to provide the ability to simultaneously use multiple paths between hosts. MPTCP currently specifies a single authentication mechanism, using keys that are initially exchanged in the clear. There are application-layer protocols that may have better information as to the identity of the parties and so is able to better provide keying material that could be used for the authentication of future subflows. This document specifies "application layer authentication" for Multipath TCP, an alternatively negotiated keying mechanism for MPTCP. Paasch, Christoph and Ford, Alan: ``TLS Authentication for MPTCP´´ (TXT, 10 KiB, ), Internet Draft draft-paasch-mptcp-tls-authentication-00, IETF, Individual Submission, May 27, 2016, [BibTeX, XML]. Abstract: Multipath TCP (MPTCP), described in , is an extension to TCP to provide the ability to simultaneously use multiple paths between peers. draft-paasch-mptcp-application-authentication specifies "application layer authentication" for Multipath TCP, an alternatively negotiated keying mechanism for MPTCP. This allows keying material to be sourced from an application layer protocol in order to secure MP_JOIN handshakes. This document explains how to use the proposed application-layer authentication extension with TLS , in order to leverage securely exchanged keys for MPTCP security, whilst simultaneously freeing the MPTCP token to be used as a channel for additional information. Winter, Rolf; Faath, Michael and Ripke, Andreas: ``Multipath TCP Support for Single-homed End-systems´´ (TXT, 19 KiB, ), Internet Draft draft-wr-mptcp-single-homed-07, IETF, Individual Submission, March 21, 2016, [BibTeX, XML]. Previous versions: draft-wr-mptcp-single-homed-06, 05, 04, 03, 02, 01, 00. Abstract: Multipath TCP relies on the existence of multiple paths between end- systems. These are typically provided by using different IP addresses obtained by different ISPs at the end-systems. While this scenario is certainly becoming increasingly a reality (e.g. mobile devices), currently most end-systems are single-homed (e.g. desktop PCs in an enterprise). It seems also likely that a lot of network sites will insist on having all traffic pass a single network element (e.g. for security reasons) before traffic is split across multiple paths. This memo therefore describes mechanisms to make multiple paths available to multipath TCP-capable end-systems that are not available directly at the end-systems but somewhere within the network. Walid, Anwar; Peng, Qiuyu; Hwang, Jaehyun and Low, Steven H.: ``Balanced Linked Adaptation Congestion Control Algorithm for MPTCP´´ (TXT, 25 KiB, ), Internet Draft draft-walid-mptcp-congestion-control-04, IETF, Individual Submission, January 23, 2016, [BibTeX, XML]. Previous versions: draft-walid-mptcp-congestion-control-03, 02, 01, 00. Abstract: This document describes the mechanism of Balia, the "Balanced linked adaptation", which is a congestion control algorithm for Multipath TCP (MPTCP). The recent proposals, LIA and OLIA, suffer from either unfriendliness to Single Path TCP (SPTCP) or unresponsiveness to network changes under certain conditions. The tradeoff between friendliness and responsiveness is inevitable, but Balia judiciously balances this tradeoff based on a new design framework that allows one to systematically explore the design space. Balia has been implemented in the Linux kernel and also included in the UCLouvain&apos;s MPTCP implementation. Paasch, Christoph; Biswas, Anumita and Haas, Darren: ``Making Multipath TCP robust for stateless webservers´´ (TXT, 33 KiB, ), Internet Draft draft-paasch-mptcp-syncookies-02, IETF, Individual Submission, October 14, 2015, [BibTeX, XML]. Abstract: This document proposes a modification of the MPTCP handshake that allows it to work efficiently with stateless servers. We first identify the issues around stateless connection establishment using SYN-cookies. Further, we suggest an extension to Multipath TCP to overcome these issues and discuss alternatives. As a side-effect, the proposed modification to the handshake opens the door to reduce the size of the MP_CAPABLE option in the SYN. This reduces the growing pressure on the TCP-option space in the SYN- segment, giving space for future extensions to TCP. Braun, Marcelo Bagnulo; Paasch, Christoph; Gont, Fernando; Bonaventure, Olivier and Raiciu, Costin: ``Analysis of Residual Threats and Possible Fixes for Multipath TCP (MPTCP)´´ (TXT, 41 KiB, ), Informational RFC 7430, IETF, DOI 10.17487/RFC7430, ISSN 2070-1721, July 2015, [BibTeX, XML]. Previous versions: draft-ietf-mptcp-attacks-04, 03, 02, 01, 00. Abstract: This document analyzes the residual threats for Multipath TCP (MPTCP) and explores possible solutions to address them. Bonaventure, Olivier; Coninck, Quentin De; Baerts, Matthieu; Duchêne, Fabien and Hesmans, Benjamin: ``Improving Multipath TCP Backup Subflows´´ (TXT, 24 KiB, ), Internet Draft draft-bonaventure-mptcp-backup-00, IETF, Individual Submission, July 6, 2015, [BibTeX, XML]. Abstract: This document documents some issues with the current definition of the backup subflows in [RFC6824]. The solution proposed in [RFC6824] works well when a subflow completely fails. However, if a subflow suffers from huge packet losses, but still remains up, then the delay to switch to the backup subflow may be very long. We propose to measure the evolution of the retransmission timer (RTO) to detect the bad performance of subflows. Bonaventure, Olivier: ``Multipath TCP Address Advertisement´´ (TXT, 21 KiB, ), Internet Draft draft-bonaventure-mptcp-addr-00, IETF, Individual Submission, July 6, 2015, [BibTeX, XML]. Abstract: Multipath TCP [RFC6824] defines the ADD_ADDR option to allow a host to announce its addresses to the remote host. In this document we analyze some of the issues with the address advertisement technique defined [RFC6824] and propose some modifications to mitigate these problems. We also show that the reverse DNS could be an excellent alternative to advertise the stable addresses of a server. Boucadair, Mohamed and Jacquenet, Christian: ``Probing MPTCP Subflows´´ (TXT, 12 KiB, ), Internet Draft draft-boucadair-mptcp-probe-subflow-00, IETF, Individual Submission, July 6, 2015, [BibTeX, XML]. Abstract: This document specifies an extension to Multipath TCP (MPTCP) that is meant to assess whether a path used to establish a given subflow is MPTCP-friendly, i.e., intermediate nodes involved in that path do not alter nor strip MPTCP options, which would prevent the establishment of MPTCP communications along that path. A new flag bit, called Probe Flag (P-flag) is defined for this purpose. This document updates RFC6824. Bonaventure, Olivier: ``Supporting long TCP options in Multipath TCP´´ (TXT, 44 KiB, ), Internet Draft draft-bonaventure-mptcp-long-options-00, IETF, Individual Submission, July 6, 2015, [BibTeX, XML]. Abstract: The extensibility of TCP is severely limited by the Data Offset field of the TCP header that limits the number of bytes that can be used in each segment to transport options. This document considers Multipath TCP as the starting point and analyses different alternatives to improve the ability of Multipath TCP to transport TCP extensions. Boucadair, Mohamed; Jacquenet, Christian; Seite, Pierrick; Bonaventure, Olivier and Deng, Lingli: ``An MPTCP Profile for NAT- and Firewall-Free Networks: Network-Assisted MPTCP Deployments´´ (TXT, 25 KiB, ), Internet Draft draft-boucadair-mptcp-natfwfree-profile-00, IETF, Individual Submission, July 3, 2015, [BibTeX, XML]. Abstract: One of the promising deployment scenarios for Multipath TCP (MPTCP) is to enable a Customer Premises Equipment (CPE) that is connected to multiple networks (e.g., DSL, LTE, WLAN) to optimize the usage of such resources, thereby providing better serviceability overall (including whenever the CPE fails to connect to one of the access networks). This document specifies a MPTCP profile for such deployments in network regions that are firewall- and NAT-free. Bonaventure, Olivier: ``Multipath TCP Timestamp Option´´ (TXT, 14 KiB, ), Internet Draft draft-bonaventure-mptcp-timestamp-01, IETF, Individual Submission, July 2, 2015, [BibTeX, XML]. Abstract: The TCP timestamps defined in [RFC1323] were designed to improve round-trip-time estimations and provide protection against wrapped sequence numbers (PAWS). This draft clarifies the utilisation of timestamps by Multipath TCP and proposes a new timestamp option that better suits the needs of Multipath TCP. Wei, Xinpeng; Xiong, Chunshan and Lopez, Edward: ``MPTCP proxy mechanisms´´ (TXT, 25 KiB, ), Internet Draft draft-wei-mptcp-proxy-mechanism-02, IETF, Individual Submission, July 1, 2015, [BibTeX, XML]. Abstract: Multipath TCP provides the ability to simultaneously use multiple paths between peers for a TCP/IP session, and it could improve resource usage within the network and, thus, improve user experience through higher throughput and improved resilience to network failure. This document discusses the mechanism of a new network entity, named MPTCP proxy, which is aimed to assist MPTCP capable peer to use MPTCP session in case of one of the peers not being MPTCP capable or to act as an aggregation point for sublfows. Appanasamy, Palanivelan and Harsha, Chetan: ``MPTCP Implementation (Challenges) Usecases´´ (TXT, 9 KiB, ), Internet Draft draft-palanivelanchetan-mptcp-challenges-usecases-00, IETF, Individual Submission, June 29, 2015, [BibTeX, XML]. Abstract: MPTCP Intends to address a wide range of issues, with minimal implementation tweaks. Though this works in a range of use cases, there are some use cases, where some standard implementation recommendations could help. The Purpose of this draft is to document the use cases, where there are opportunities for standard implementation recommendations. Bonaventure, Olivier; Hesmans, Benjamin and Boucadair, Mohamed: ``Experimental Multipath TCP option´´ (TXT, 17 KiB, ), Internet Draft draft-bonaventure-mptcp-exp-option-00, IETF, Individual Submission, June 16, 2015, [BibTeX, XML]. Abstract: This document proposes a generic format for an experimental Multipath TCP option. This experimental option is expected to replace the option type that was reserved for private use in [RFC6824]. Krupakaran, Kesava Vijaya; Sridharan, Aravind Prasad and Venkatesan, Shathish Muthu: ``Optimized Multipath TCP subflows using Traceflow´´ (TXT, 19 KiB, ), Internet Draft draft-aravind-mptcp-optimized-subflows-00, IETF, Individual Submission, April 7, 2015, [BibTeX, XML]. Abstract: This document proposes a solution for optimized usage of MPTCP and its subflows. Boucadair, Mohamed and Jacquenet, Christian: ``An Extension to MPTCP for Symmetrical Sub-Flow Management´´ (TXT, 14 KiB, ), Internet Draft draft-boucadair-mptcp-symmetric-02, IETF, Individual Submission, March 9, 2015, [BibTeX, XML]. Abstract: This document specifies a MPTCP extension that allows to achieve symmetrical subflow management. In particular, this extension allows both endpoints to add new subflows whenever needed without waiting for the endpoint which initiated the first subflow to add new ones. This document updates RFC 6824. Boucadair, Mohamed and Jacquenet, Christian: ``MPTCP Connectivity Checks´´ (TXT, 18 KiB, ), Internet Draft draft-boucadair-mptcp-connectivity-checks-00, IETF, Individual Submission, March 4, 2015, [BibTeX, XML]. Abstract: This document specifies an extension to minimize the delay induced by the presence of MPTCP-unfriendly nodes in some of the paths selected by a MPTCP endpoint, and which may support the establishment of MPTCP subflows. Concretely, this procedure allows a MPTCP endpoint to assess whether the networks the endpoint connects to are compliant with MPTCP signals or not. The procedure is not enabled for every new MPTCP connection; it is activated upon bootstrap or when a network attachment change occurs (e.g., attach to a new network, discover a new external IP address, etc.). Lopez, Edward: ``Multipath TCP Middlebox Behavior´´ (TXT, 19 KiB, ), Internet Draft draft-lopez-mptcp-middlebox-00, IETF, Individual Submission, November 11, 2014, [BibTeX, XML]. Abstract: As implementation of MPTCP continues to grow, there will be interaction concerns regarding MPTCP sessions relative to the functionality of middleboxes, particularly those focused on network- based security. The purpose of this draft is to review this interaction of MPTCp sessions and middleboxes, the likely response of middlebox providers in dealing with any functional degradation due to MPTCP, and the potential requirements to support proxy functionality for MPTCP sessions. Bonaventure, Olivier: ``MPTLS : Making TLS and Multipath TCP stronger together´´ (TXT, 52 KiB, ), Internet Draft draft-bonaventure-mptcp-tls-00, IETF, Individual Submission, October 27, 2014, [BibTeX, XML]. Abstract: Multipath TCP and the Transport Layer Security (TLS) include several techniques that improve the reliability and the security of data transfers. In this document we propose Multipath TLS (MPTLS), a tighter coupling between TLS and Multipath TCP that provides improved security and reliability in the presence of adversaries. MPTLS would the resilience of existing TLS applications to attacks. It could also serve as a basis for the TCP extension that is being discussed within the TCPINC working group to provide unauthenticated encryption and integrity protection of TCP streams. Deng, Lingli; Liu, Dapeng; Sun, Tao; Boucadair, Mohamed and Cauchie, Gregory: ``Use-cases and Requirements for MPTCP Proxy in ISP Networks´´ (TXT, 40 KiB, ), Internet Draft draft-deng-mptcp-proxy-01, IETF, Individual Submission, October 26, 2014, [BibTeX, XML]. Abstract: This document presents the use-cases and identifies requirements for ISP deployed MPTCP proxies for both Fixed and Mobile networks. Khalili, Ramin; Gast, Nicolas Garbiel; Popović, Miroslav and Boudec, Jean-Yves Le: ``Opportunistic Linked-Increases Congestion Control Algorithm for MPTCP´´ (TXT, 24 KiB, ), Internet Draft draft-khalili-mptcp-congestion-control-05, IETF, Individual Submission, July 4, 2014, [BibTeX, XML]. Previous versions: draft-khalili-mptcp-congestion-control-04, 03, 02, 01, 00. Abstract: This document describes the mechanism of OLIA, the "Opportunistic Linked Increases Algorithm". OLIA is a congestion control algorithm for MPTCP. The current congestion control algorithm of MPTCP, LIA , forces a tradeoff between optimal congestion balancing and responsiveness. OLIA&apos;s design departs from this tradeoff and provide these properties simultaneously. Hence, it solves the identified performance problems with LIA while retaining non-flappiness and responsiveness behavior of LIA, as shown by different studies [5, 6, 7, 8]. OLIA is now part of the UCLouvain&apos;s MPTCP implementation [9, 11]. Khalili, Ramin; Gast, Nicolas Garbiel; Popović, Miroslav and Boudec, Jean-Yves Le: ``Performance Issues with MPTCP´´ (TXT, 44 KiB, ), Internet Draft draft-khalili-mptcp-performance-issues-06, IETF, Individual Submission, July 4, 2014, [BibTeX, XML]. Previous versions: draft-khalili-mptcp-performance-issues-05, 04, 03, 02, 01, 00. Abstract: We show, by measurements over a testbed and by mathematical analysis, that the current MPTCP suffers from two problems: (P1) Upgrading some TCP users to MPTCP can reduce the throughput of others without any benefit to the upgraded users; and (P2) MPTCP users can be excessively aggressive towards TCP users. We attribute these problems to the "Linked Increases" Algorithm (LIA) of MPTCP , and more specifically, to an excessive amount of traffic transmitted over congested paths. Our results show that these problems are important and can be mitigated. We believe that the design of the congestion control of MPTCP should be improved. Bonaventure, Olivier; Paasch, Christoph and Detal, Gregory: ``Processing of RST segments by Multipath TCP´´ (TXT, 28 KiB, ), Internet Draft draft-bonaventure-mptcp-rst-00, IETF, Individual Submission, July 3, 2014, [BibTeX, XML]. Abstract: This document discusses how a Multipath TCP implementation should generate and process RST segments. Deng, Lingli; Liu, Dapeng and Sun, Tao: ``MPTCP Proxy for Mobile Networks´´ (TXT, 13 KiB, ), Internet Draft draft-deng-mptcp-mobile-network-proxy-00, IETF, Individual Submission, February 14, 2014, [BibTeX, XML]. Abstract: This document discusses the motivation and usecases for ISP deployed MPTCP proxies in mobile networks. Braun, Marcelo Bagnulo: ``Secure MPTCP´´ (TXT, 18 KiB, ), Internet Draft draft-bagnulo-mptcp-secure-00, IETF, Individual Submission, February 12, 2014, [BibTeX, XML]. Abstract: This memo contains some initial thoughts about how to secure MPTCP. As currently defined, MPTCP provides basic security features to protect the MPTCP signaling and the data flows unprotected. In this note, we explore the possible use to tcpcrypt to provide enhanced security to MPTCP. Paasch, Christoph and Bonaventure, Olivier: ``A generic control stream for Multipath TCP´´ (TXT, 27 KiB, ), Internet Draft draft-paasch-mptcp-control-stream-00, IETF, Individual Submission, February 11, 2014, [BibTeX, XML]. Abstract: Multipath TCP&apos;s extensive use of TCP options to exchange control information consumes a significant part of the TCP option space. Extending MPTCP to add more control information into the session becomes cumbersome as the TCP option space is limited to 40 bytes. This draft introduces a control stream that allows to send control information as part of the subflow&apos;s payload. The control stream is mapped into a separate sequence number space and uses a TLV-format for maximum extensibility. It is left to future documents to specify how the TLV-format might be used to exchange control information. As the control stream is sent as part of the subflow&apos;s payload, it is not subject to the 40 bytes limitation of the TCP option space. Deng, Zhenjie: ``Non-Renegable Selective Acknowledgements (NR-SACKs) for MPTCP´´ (TXT, 20 KiB, ), Internet Draft draft-deng-mptcp-nrsack-00, IETF, Individual Submission, December 2, 2013, [BibTeX, XML]. Abstract: Multipath Transmission Control Protocol (MPTCP) [RFC6824] adopts Selective Acknowledgements (SACKs) at the subflow level to allow an MPTCP receiver to acknowledge the receipt of out-of-order data. In MPTCP, SACK information is expected (but not mandated)–though SACKs notify a data sender the reception of specific out-of-order data, the out-of-order data cannot be delivered to application layer until it has been cumulatively acknowledged at the connection-level. The MPTCP data receiver is permitted to later abandon the out-of-order data cached in the receive buffer. The out-of-order data is called renegable. Since the delivery of a SACKed out-of-order data is renegable, the sender has to maintain copies of SACKed data in the send buffer until it is cumulatively acked. As a result, the send buffer is inevitably wasted and the transmission rate is restricted even though the network is not congested. Wing, Dan; R, R.; Reddy, Tirumaleswar; Ford, Alan and Penno, Reinaldo: ``Multipath TCP (MPTCP) Path Selection using PCP´´ (TXT, 22 KiB, ), Internet Draft draft-wing-mptcp-pcp-00, IETF, Individual Submission, October 7, 2013, [BibTeX, XML]. Abstract: MultiPath TCP (MPTCP) allows a host to use multiple interfaces to transfer data. Without knowledge of the characterisitcs of each network path, the MPTCP stack has to send data to learn those characteristics. This document communicates network characteristics using Port Control Protocol(PCP) to allow the MPTCP stack influence its functions. Coene, Yvan: ``Conformance tests for Multipath TCP´´ (TXT, 21 KiB, ), Internet Draft draft-coene-mptcp-conformance-00, IETF, Individual Submission, July 15, 2013, [BibTeX, XML]. Abstract: This document describes a series of tests which aim at evaluating the compliance of Multipath TCP (MPTCP) implementations to [RFC6824]. The current version of this document focuses on the conformance of the three-way handshake. Subsequent versions of the document will contain tests for the other parts of the protocol. Eardley, Philip L.: ``Survey of MPTCP Implementations´´ (TXT, 88 KiB, ), Internet Draft draft-eardley-mptcp-implementations-survey-02, IETF, Individual Submission, July 12, 2013, [BibTeX, XML]. Abstract: This document presents results from the survey to gather information from people who have implemented MPTCP, in particular to help progress the protocol from Experimental to Standards track. The document currently includes answers from four teams: a Linux implementation from UCLouvain, a FreeBSD implementation from Swinburne, an anonymous implementation in a commercial OS, and a NetScalar Firmware implementation from Citrix Systems, Inc. Thank- you! In summary, we have four independent implementations of all the MPTCP signalling messages, with the exception of address management, and some interoperabiity testing has been done by the other three implementations with the &apos;reference&apos; Linux implementation. So it appears that the RFC is (at least largely) clear and correct. On address management, we have only one implementation of ADD_ADDR with two teams choosing not to implement it. We have one implementation of the working group&apos;s coupled congestion control (RFC6356) and none of the MPTCP-aware API (RFC6897). The main suggested improvements are around o how MPTCP falls back (if the signalling is interrupted by a middlebox): (1) corner cases that are not handled properly, (2) at the IETF, the MPTCP community should work with middlebox vendors, either to reduce or eliminate the need for fallback or to understand the middlebox interactions better. o security: both better MPTCP security (perhaps building on SSL) and a lighter weight mechanism, preferably both in one mechanism. It is hoped that the next version can include information from any other implementations. If you are an implementer and want to contribute your answers, please see the -01 version of this document for a blank survey ready to be filled in. Xue, Kaiping; Guo, Jing; Hong, Peilin and Zhu, Lei: ``TMPP for Both Two MPTCP-unaware Hosts´´ (TXT, 30 KiB, ), Internet Draft draft-xue-mptcp-tmpp-unware-hosts-02, IETF, Individual Submission, June 20, 2013, [BibTeX, XML]. Abstract: Transparent MPTCP Proxy(TMPP) is an introduced network-based function, which is under MPTCP architecture. It can help two MPTCP- unaware hosts enjoy multipath support, and can be extensively used both in the access networks and operators&apos; networks. Meanwhile, in MPTCP architecture with TMPP, TMPP needs to modify the received packets and transmit them again(just like gateway in NAT environment). In this document, we also discuss the guarantee for data transfer on TMPP&apos;s side. The consideration of data transfer can be expanded to the MPTCP architecture with proxy. Scharf, Michael and Ford, Alan: ``Multipath TCP (MPTCP) Application Interface Considerations´´ (TXT, 74 KiB, ), Informational RFC 6897, IETF, DOI 10.17487/RFC6897, ISSN 2070-1721, March 2013, [BibTeX, XML]. Previous versions: draft-ietf-mptcp-api-07, 06, 05, 04, 03, 02, 01, 00. Historic versions: draft-scharf-mptcp-api-02, 01, 00. Abstract: Multipath TCP (MPTCP) adds the capability of using multiple paths to a regular TCP session. Even though it is designed to be totally backward compatible to applications, the data transport differs compared to regular TCP, and there are several additional degrees of freedom that applications may wish to exploit. This document summarizes the impact that MPTCP may have on applications, such as changes in performance. Furthermore, it discusses compatibility issues of MPTCP in combination with non-MPTCP-aware applications. Finally, the document describes a basic application interface that is a simple extension of TCP&apos;s interface for MPTCP-aware applications. Ford, Alan; Raiciu, Costin; Handley, Mark and Bonaventure, Olivier: ``TCP Extensions for Multipath Operation with Multiple Addresses´´ (TXT, 162 KiB, ), RFC 6824, IETF, DOI 10.17487/RFC6824, ISSN 2070-1721, January 2013, [BibTeX, XML]. Previous versions: draft-ietf-mptcp-multiaddressed-12, 11, 10, 09, 08, 07, 06, 05, 04, 03, 02, 01, 00. Historic versions: draft-ford-mptcp-multiaddressed-03, 02, 01, 00. Abstract: TCP/IP communication is currently restricted to a single path per connection, yet multiple paths often exist between peers. The simultaneous use of these multiple paths for a TCP/IP session would improve resource usage within the network and, thus, improve user experience through higher throughput and improved resilience to network failure. Paasch, Christoph and Bonaventure, Olivier: ``MultiPath TCP Low Overhead´´ (TXT, 18 KiB, ), Internet Draft draft-paasch-mptcp-lowoverhead-00, IETF, Individual Submission, October 15, 2012, [BibTeX, XML]. Abstract: This document describes a low overhead connection establishment mechanism for Multipath TCP. Its goal is to reduce the computational overhead of establishing an MPTCP connection and the associated TCP subflows in controlled environments where security attacks are not a concern. Paasch, Christoph and Bonaventure, Olivier: ``Securing the MultiPath TCP handshake with external keys´´ (TXT, 15 KiB, ), Internet Draft draft-paasch-mptcp-ssl-00, IETF, Individual Submission, October 15, 2012, [BibTeX, XML]. Abstract: Multipath TCP currently relies on the exchange of keys in clear during the initial handshake to authenticate the establishment of additional subflows. This document proposes a variant of the Multipath TCP handshake that allows Multipath TCP to reuse keys negotiated by the Application layer protocol above it such as SSL/TLS to authenticate the establishment of additional subflows. Hampel, Georg and Klein, Thierry E.: ``MPTCP Proxies and Anchors´´ (TXT, 61 KiB, ), Internet Draft draft-hampel-mptcp-proxies-anchors-00, IETF, Individual Submission, February 8, 2012, [BibTeX, XML]. Abstract: MPTCP proxies and anchors are network-based functions, which support MPTCP connections. The MPTCP proxy provides multipath support for MPTCP-capable hosts on behalf of their MPTCP-unaware peers. This facilitates incremental deployment of MPTCP. The MPTCP anchor permits subflow establishment for MPTCP connections when direct interaction between end hosts fails. This permits tolerance to local IP protocol restrictions and it provides robustness in case of break- before-make mobility events. MPTCP proxies and anchors are especially suited for wireless access environments. Raiciu, Costin; Handley, Mark and Wischik, Damon: ``Coupled Congestion Control for Multipath Transport Protocols´´ (TXT, 28 KiB, ), RFC 6356, IETF, DOI 10.17487/RFC6356, ISSN 2070-1721, October 2011, [BibTeX, XML]. Previous versions: draft-ietf-mptcp-congestion-07, 06, 05, 04, 03, 02, 01, 00. Abstract: Often endpoints are connected by multiple paths, but communications are usually restricted to a single path per connection. Resource usage within the network would be more efficient were it possible for these multiple paths to be used concurrently. Multipath TCP is a proposal to achieve multipath transport in TCP. Hampel, Georg and Klein, Thierry E.: ``Enhancements to Improve the Applicability of Multipath TCP to Wireless Access Networks´´ (TXT, 51 KiB, ), Internet Draft draft-hampel-mptcp-applicability-wireless-networks-00, IETF, Individual Submission, June 15, 2011, [BibTeX, XML]. Abstract: This document analyses the applicability of Multipath TCP to wireless access networks with overlapping coverage area, and it discusses potential protocol extensions that aim to improve operation in such environments. The analysis attempts to identify use cases, benefits as well as technical and functional obstacles encountered in the current version of the protocol. Based on this analysis, recommendations are made on feature-, signaling- and policy extensions that promise to enhance Multipath-TCP&apos;s value, versatility and market acceptance in wireless access networks. Ford, Alan; Raiciu, Costin; Handley, Mark; Barré, Sébastien and Iyengar, Janardhan R.: ``Architectural Guidelines for Multipath TCP Development´´ (TXT, 68 KiB, ), Informational RFC 6182, IETF, DOI 10.17487/RFC6182, ISSN 2070-1721, March 2011, [BibTeX, XML]. Previous versions: draft-ietf-mptcp-architecture-05, 04, 03, 02, 01, 00. Abstract: Hosts are often connected by multiple paths, but TCP restricts communications to a single path per transport connection. Resource usage within the network would be more efficient were these multiple paths able to be used concurrently. This should enhance user experience through improved resilience to network failure and higher throughput. Braun, Marcelo Bagnulo: ``Threat Analysis for TCP Extensions for Multipath Operation with Multiple Addresses´´ (TXT, 44 KiB, ), Informational RFC 6181, IETF, DOI 10.17487/RFC6181, ISSN 2070-1721, March 2011, [BibTeX, XML]. Previous versions: draft-ietf-mptcp-threat-08, 07, 06, 05, 04, 03, 02, 01, 00. Abstract: Multipath TCP (MPTCP for short) describes the extensions proposed for TCP so that endpoints of a given TCP connection can use multiple paths to exchange data. Such extensions enable the exchange of segments using different source-destination address pairs, resulting in the capability of using multiple paths in a significant number of scenarios. Some level of multihoming and mobility support can be achieved through these extensions. However, the support for multiple IP addresses per endpoint may have implications on the security of the resulting MPTCP. This note includes a threat analysis for MPTCP. This document is not an Internet Standards Track specification; it is published for informational purposes. Barré, Sébastien and Paasch, Christoph: ``MultiPath TCP – Guidelines for implementers´´ (TXT, 93 KiB, ), Internet Draft draft-barre-mptcp-impl-00, IETF, Individual Submission, March 7, 2011, [BibTeX, XML]. Abstract: Multipath TCP is a major extension to TCP that allows improving the resource usage in the current Internet by transmitting data over several TCP subflows, while still showing one single regular TCP socket to the application. This document describes our experience in writing a MultiPath TCP implementation in the Linux kernel and discusses implementation guidelines that could be useful for other developers who are planning to add MultiPath TCP to their networking stack. Scharf, Michael and Ford, Alan: ``MPTCP Application Interface Considerations´´ (TXT, 62 KiB, ), Internet Draft draft-scharf-mptcp-api-04, IETF, Individual Submission, November 22, 2010, [BibTeX, XML]. Previous versions: draft-scharf-mptcp-api-03, 02, 01, 00. Abstract: Multipath TCP (MPTCP) adds the capability of using multiple paths to a regular TCP session. Even though it is designed to be totally backward compatible to applications, the data transport differs compared to regular TCP, and there are several additional degrees of freedom that applications may wish to exploit. This document summarizes the impact that MPTCP may have on applications, such as changes in performance. Furthermore, it discusses compatibility issues of MPTCP in combination with non-MPTCP-aware applications. Finally, the document describes a basic application interface for MPTCP-aware applications that provides access to multipath address information and a level of control equivalent to regular TCP. Singh, Amanpreet and Scharf, Michael: ``PayLoad Multi-connection Transport using Multiple Addresses´´ (TXT, 80 KiB, ), Internet Draft draft-singh-mptcp-plmt-00, IETF, Individual Submission, August 6, 2010, [BibTeX, XML]. Abstract: The single path transport provided by the Transmission Control Protocol (TCP) can be extended to a multipath transport session for multi-homed end hosts by coupling several TCP connections over multiple interfaces of the end hosts. Payload Multi-connection Transport (PLMT) is a multipath protocol variant that encodes all the control/signaling information in the payload of TCP connections and therefore requires no additional TCP options. PLMT allows for the simultaneous use of the multiple connections over potentially disjoint paths while being mostly backward compatible to single path transport of TCP. PLMT operates as an additional protocol layer between the network stack and the application layer. This document describes PLMT as an example for a multipath mechanism that could possibly be realized entirely in the user-space of an operating system. Scharf, Michael: ``Multi-Connection TCP (MCTCP) Transport´´ (TXT, 90 KiB, ), Internet Draft draft-scharf-mptcp-mctcp-01, IETF, Individual Submission, July 12, 2010, [BibTeX, XML]. Abstract: Multipath transport over potentially different paths can be realized by several coupled Transmission Control Protocol (TCP) connections. Multi-Connection TCP (MCTCP) transport aggregates multiple TCP connections between potentially different addresses into a single session that can be accessed by an application like a single TCP connection. MCTCP encodes control information, as far as possible, in the payload of the TCP connections and therefore requires only minor changes in the TCP implementations, and it is transparent in the single-path case. MCTCP is therefore proposed as a simple, modular, and extensible mechanism for multipath transport. Raiciu, Costin; Handley, Mark and Wischik, Damon: ``Coupled Multipath-Aware Congestion Control´´ (TXT, 23 KiB, ), Internet Draft draft-raiciu-mptcp-congestion-01, IETF, Individual Submission, March 8, 2010, [BibTeX, XML]. Abstract: Often endpoints are connected by multiple paths, but communications are usually restricted to a single path per connection. Resource usage within the network would be more efficient were it possible for these multiple paths to be used concurrently. Multipath TCP is a proposal to achieve multipath transport in TCP. New congestion control algorithms are needed for multipath transport protocols such as Multipath TCP, as single path algorithms have a series of issues in the multipath context. One of the prominent problems is that running existing algorithms such as TCP New Reno independently on each path would give the multipath flow more than its fair share at a bottleneck link traversed by more than one of its subflows. Further, it is desirable that a source with multiple paths available will transfer more traffic using the least congested of the paths, hence achieving resource pooling. This would increase the overall utilization of the network and also its robustness to failure. This document presents a congestion control algorithm which couples the congestion control algorithms running on different subflows by linking their increase functions, and dynamically controls the overall aggresiveness of the multipath flow. The result is a practical algorithm that is fair to TCP at bottlenecks while moving traffic away from congested links. Sarolahti, Pasi: ``Multi-address Interface in the Socket API´´ (TXT, 31 KiB, ), Internet Draft draft-sarolahti-mptcp-af-multipath-01, IETF, Individual Submission, March 4, 2010, [BibTeX, XML]. Abstract: This document specifies a new address family to be used for sockets that are bound to more than one IP address, as motivated by the Multipath TCP work in the IETF. The goal is to use the same set of function calls as traditionally, but by new address family make it possible for them to express multiple addresses to connect or bind to. The document gives a high-level definition of the behavior of the traditional function calls, but a detailed specification of the API syntax is not in the scope of this document. Handley, Mark; Raiciu, Costin and Braun, Marcelo Bagnulo: ``Outgoing Packet Routing with MP-TCP´´ (TXT, 32 KiB, ), Internet Draft draft-handley-mptcp-routing-00, IETF, Individual Submission, October 19, 2009, [BibTeX, XML]. Abstract: Multipath TCP extends the TCP protocol to allow multiple paths to be used simultaneously for the same TCP connection. The different paths are typically provided using multiple IP addresses for the same end system, each address taken from a subnet that is routed differently. In this document we describe a set of conventions for how to ensure that outgoing packets are routed in a manner consistent with the network topology and constraints on use of that topology such as those imposed by ingress filtering on IP address prefixes.